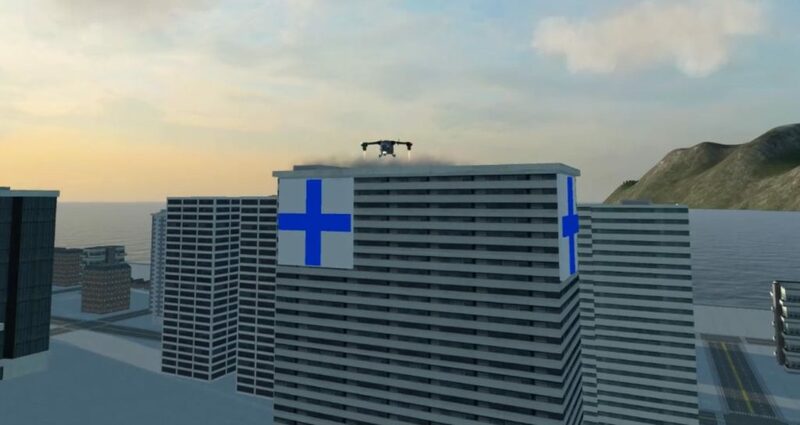 VTOL VR is one of the most unique and revolutionary simulations ever released. With a unique visual style, superb gameplay, and shockingly deep systems functionality, this sim is special in ways that defy classification. I’ll go ahead and issue the warning now – you know how your coffee maker has the option for the small cup or the big cup? 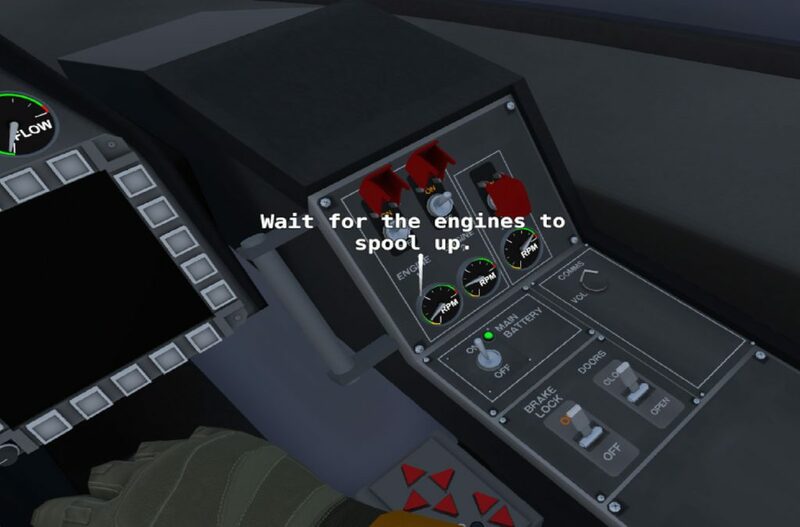 Well, you’re going to need the big cup for this review, because I have a LOT to say about this sim. The reason I know this to be true is because I’ve been sitting on this review for over a year and a half now. 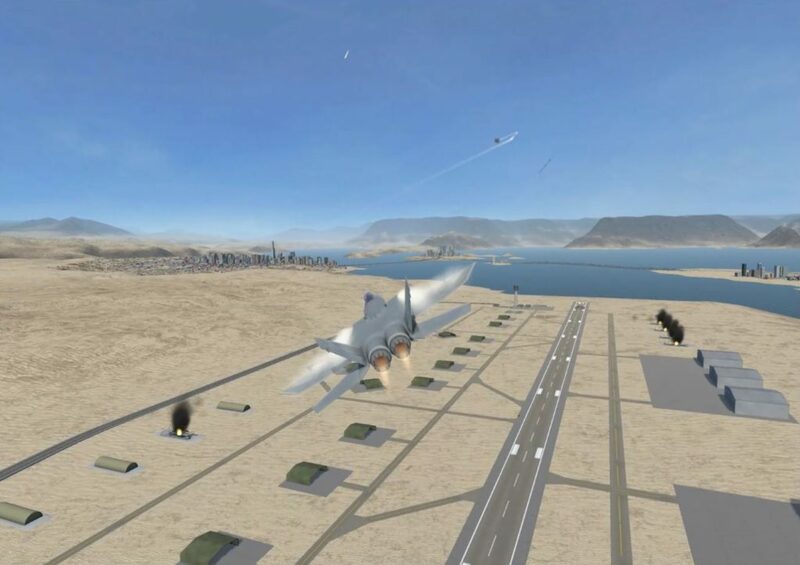 Due to its early access state, the review for this sim is definitely a moving target. 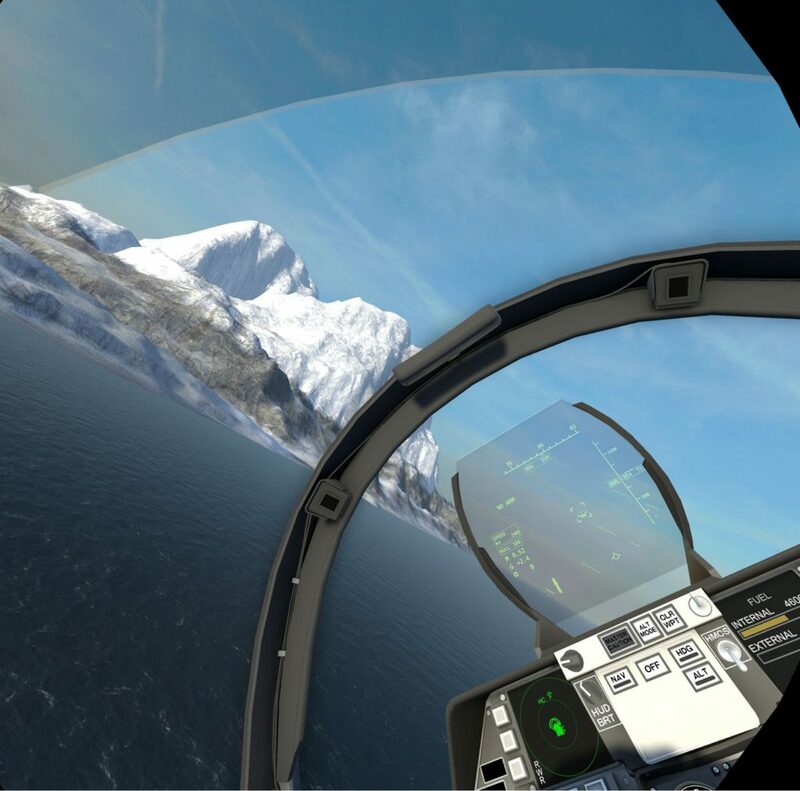 The one man development team, Paolo Encarnacion, releases updates every few weeks to months that add interesting new features, bug fixes, and just overall awesomeness to an already astounding simulator. 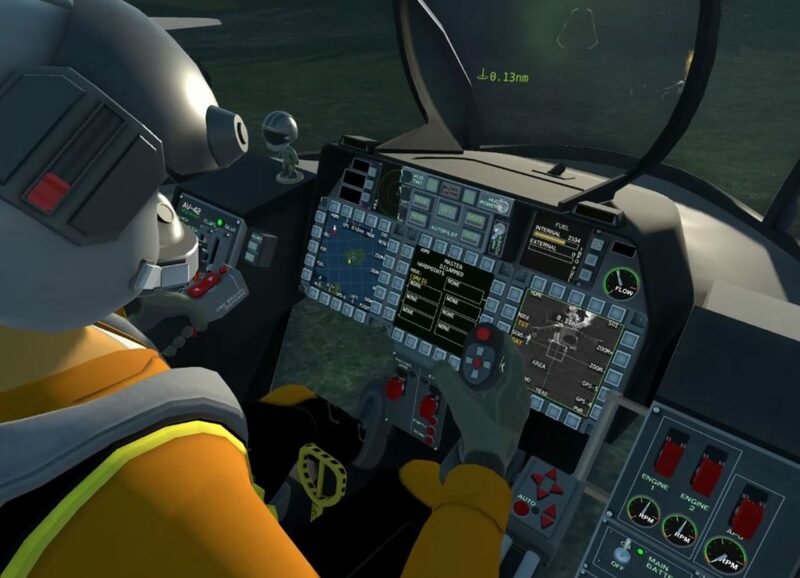 Paolo is extremely in touch with his customer and user community, interacts with them regularly, and is very accessible – the result is a sim that gets better with each new patch and update. 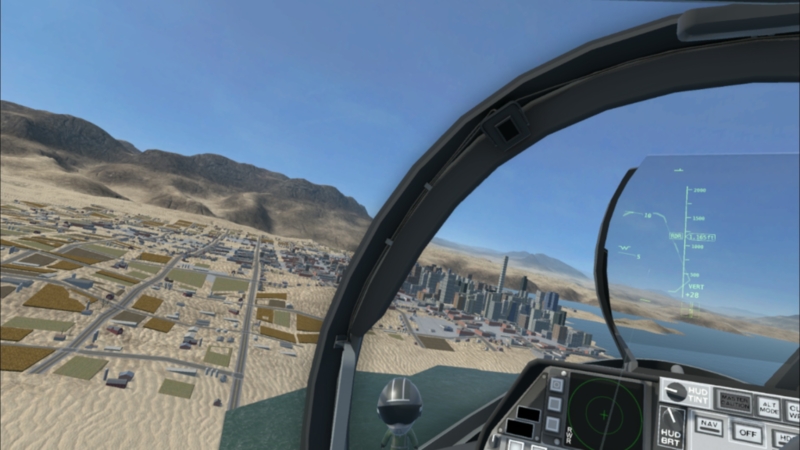 VTOL VR is built from the ground up exclusively for virtual reality (VR). I can hear the groans already, but trust me when I say that the VR roots of this sim are what makes it as great as it is. 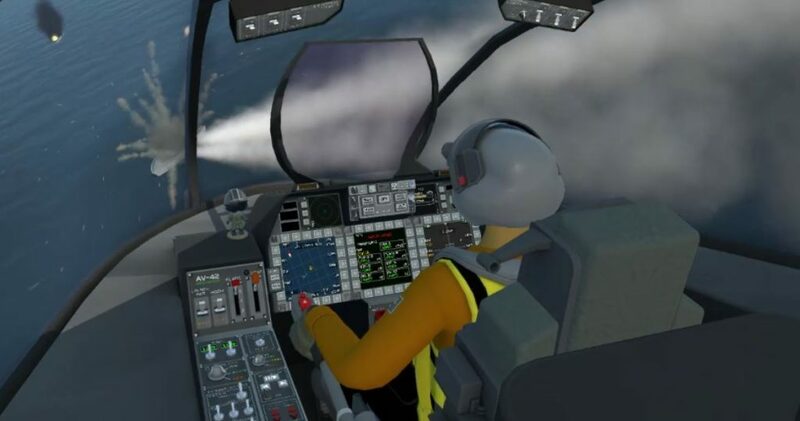 With that said, I would not discount that this could be a fun and appealing 2D simulator as well, but once you enter that end of the pool, you draw in comparisons to other simulators that this sim is not trying to be. 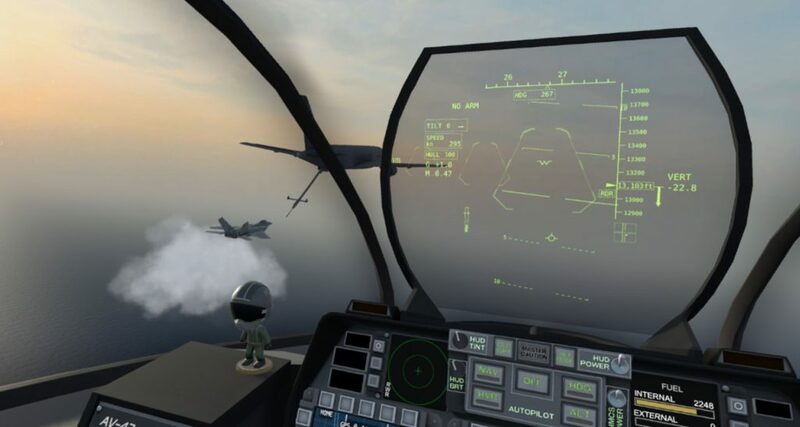 Oddly enough, this sim takes the very best from other simulators and condenses them down into a near perfect VR experience that actually feels as deep as you might find in those other combat flight sims. A quick note to consider as well – the screens in this review are largely captured from either the left or right eye of a VR headset. 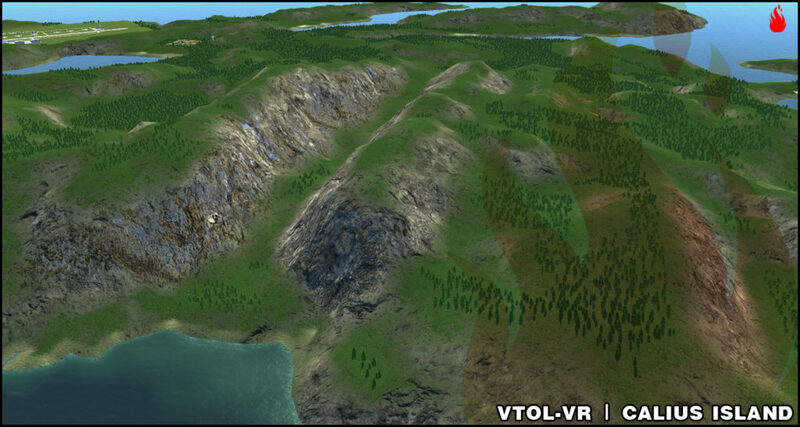 As such, they don’t reflect the true field of view, level of detail, or sense of scale that you get in VR. 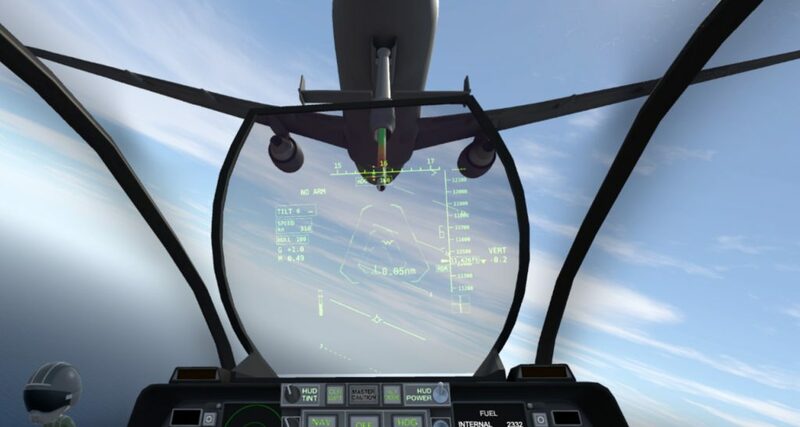 It is hard to describe, but just know these screens are more meant to illustrate the features of the sim rather than what it actually feels like in VR. I have not yet discovered a way to adequately translate what VR looks and feels like, so I’d encourage you to track down a headset or demo and give VR a whirl. 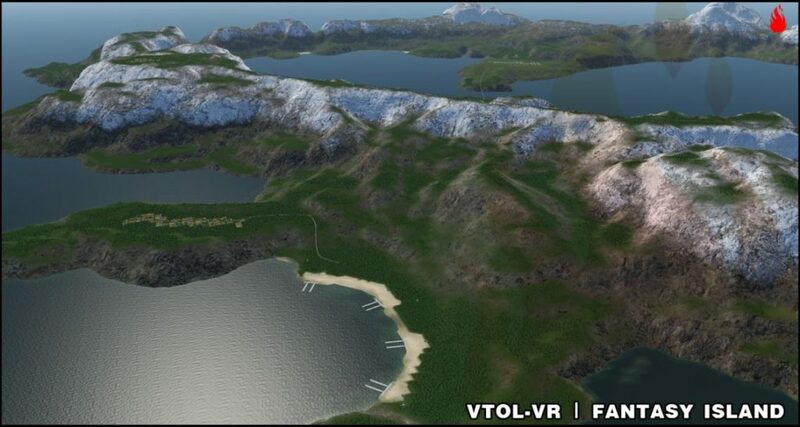 Before we get to specifics, I will comment on why I think this sim is so good – specifically with regards to VR. 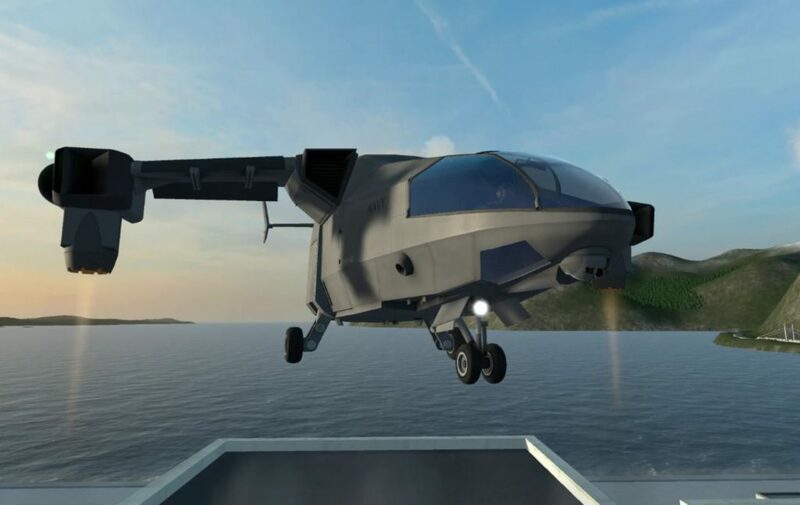 Since it was built entirely for VR, VTOL doesn’t try to shoehorn VR in as an afterthought – it was purpose built for the slightly lower resolution and wider field of view that VR offers. 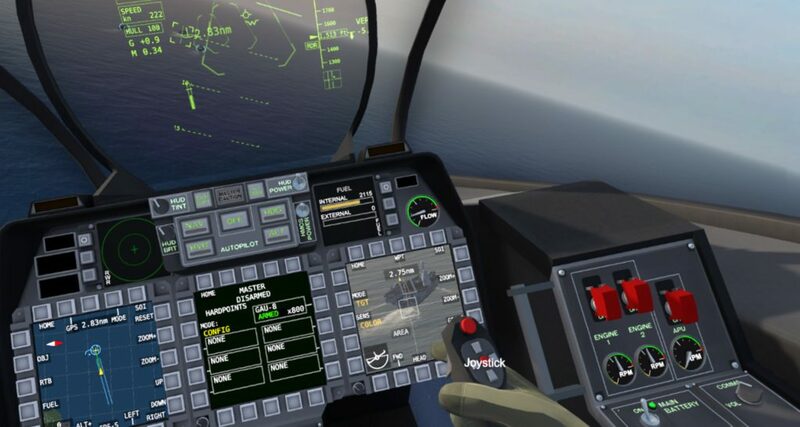 The cockpits are wide and expansive, the panels have large fonts that are easy to read, and the switches, buttons, knobs, and controls are all crafted to be easy to manipulate with VR hand controllers (now is a good time also to mention that hand controllers are a requirement!). 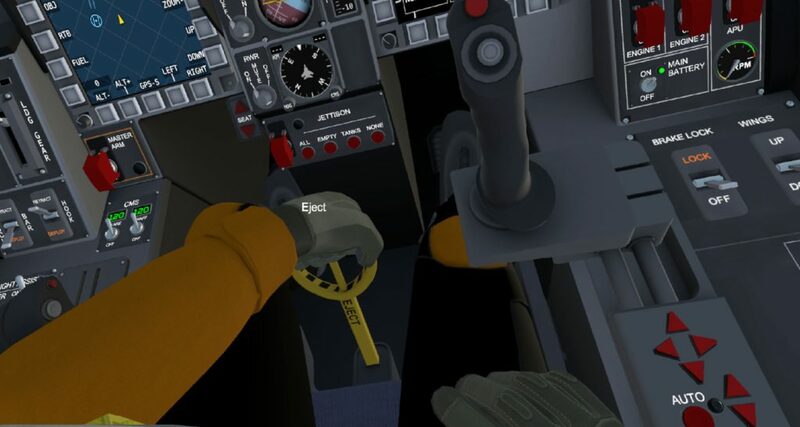 I can’t tell you how natural feeling it is to move your VR hands throughout the cockpit quickly hitting MFD buttons or going through a brief cold-start procedure. 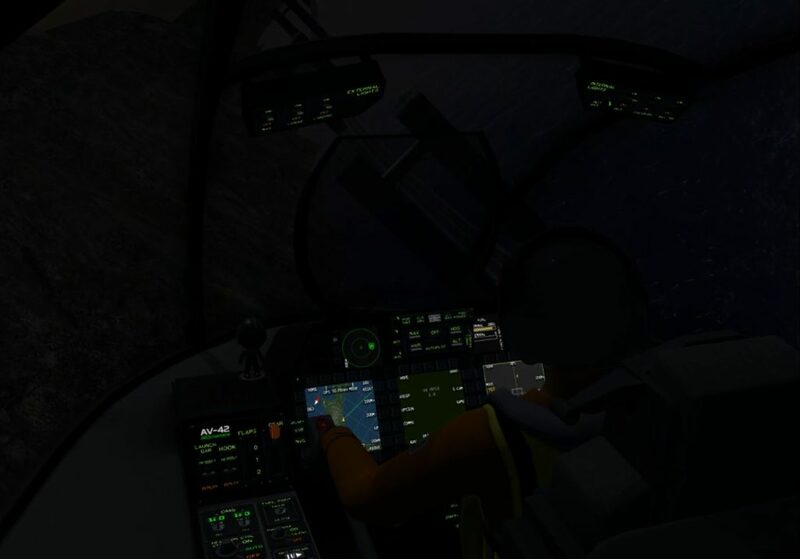 It feels the most like being in a real aircraf of any sim I’ve flown. 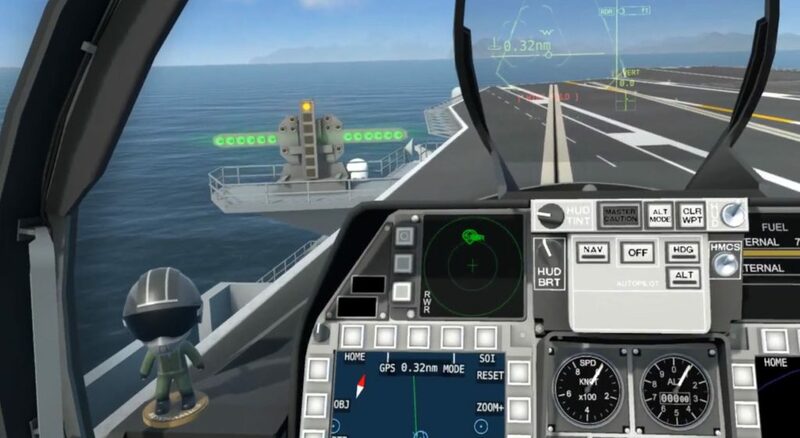 Addendum to this review showing some of the VTOL VR features in a quick cold start / takeoff / refuel / carrier landing mission. 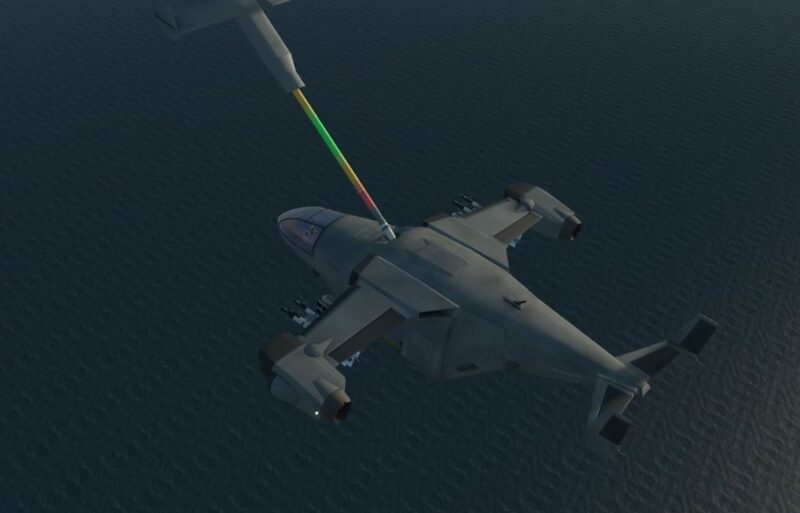 VTOL VR currently features two aircraft – the VTOL capable AV-42C “Kestrel” and the as yet unnamed F/A-26B. 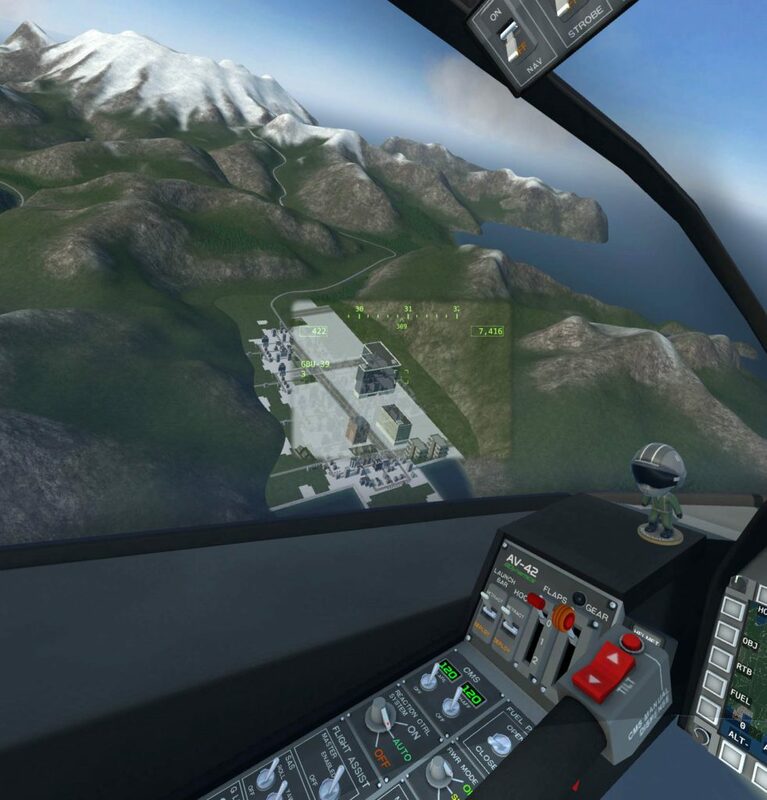 The sim launched a couple of years ago with the AV-42C. 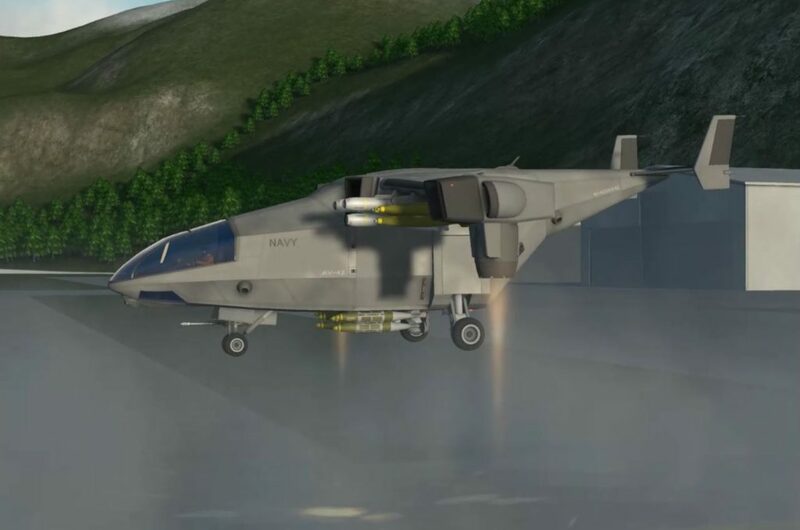 Last year, the F/A-26B was added, providing a more traditional fast fighter/attack jet. 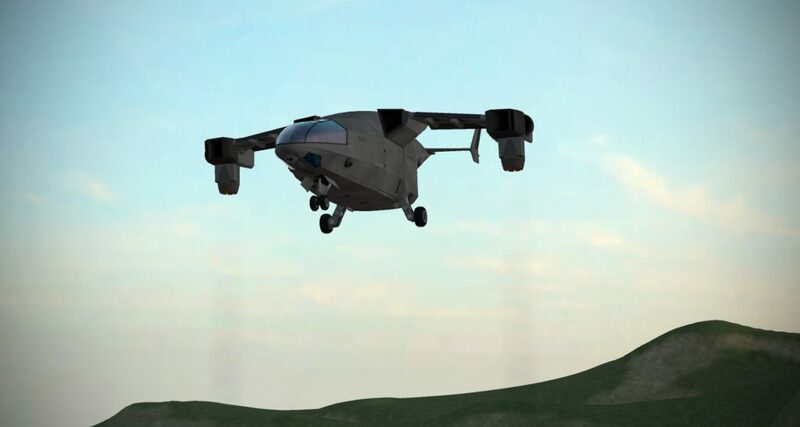 The AV-42C is capable of taking off and landing vertically if your weight allows for it, or you can rotate the wingtip mounted nacelles anywhere between 0° and 90° to provide for short-takeoff and landing, or completely normal takeoffs and landings. The AV-42C has a troop carrying compartment that can carry up to eight soldiers – this capability makes the AV-42C a great transport and search & rescue vehicle. 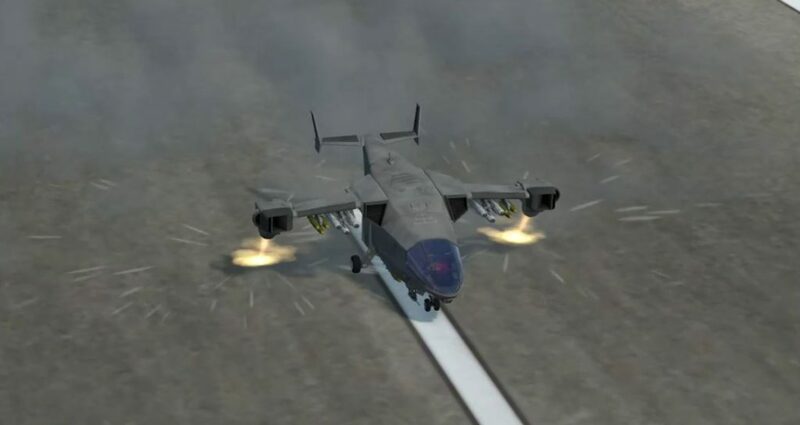 The F/A-26B is a carrier based air-superiority fighter that is also suited to ground attack roles. 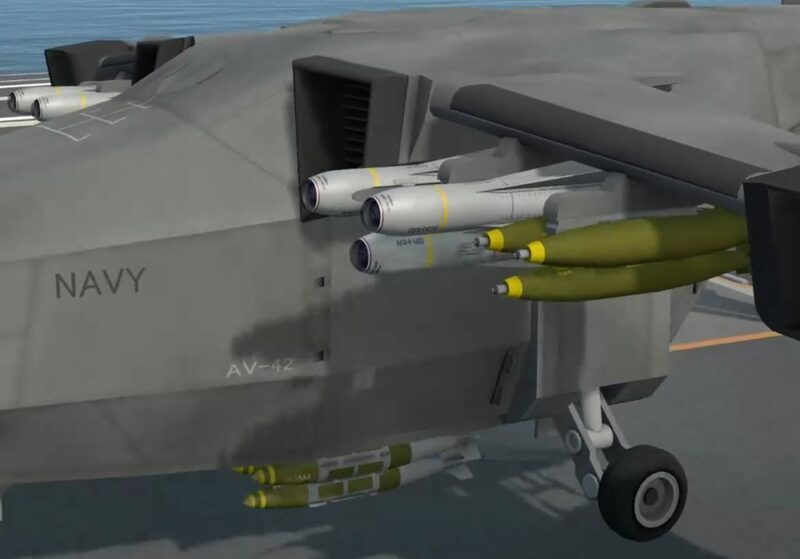 Both the F/A-26B and AV-42C have launch bars and tailhooks to allow for traditional aircraft carrier catapult launches and arrested landings. 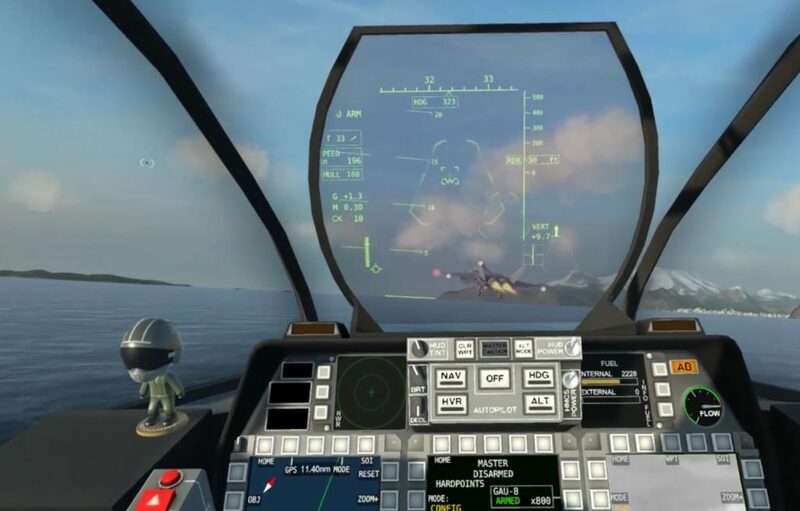 The cockpits are slightly different between the VTOL and the fighter, with the Kestrel sporting three multi-function displays (MFDs) while the F/A-26B fighter only has two. 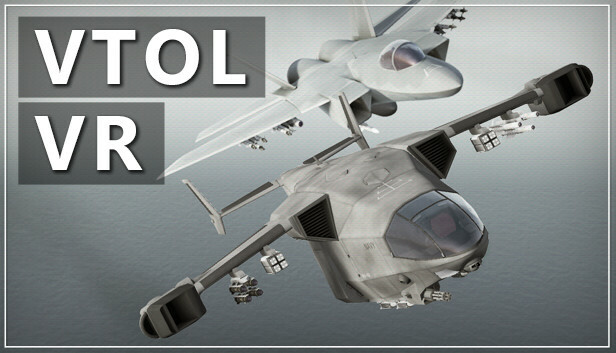 The Kestrel has permanently mounted targeting optics, while the fighter has a hard point that a targeting pod (TGP) can be mounted to. 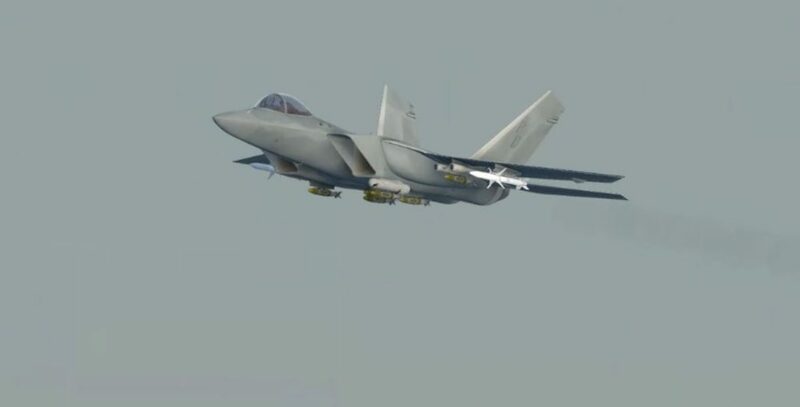 The fighter also is equipped with an air-to-air radar, giving it a bit of an edge for anti-air work since it can use radar guided missiles. 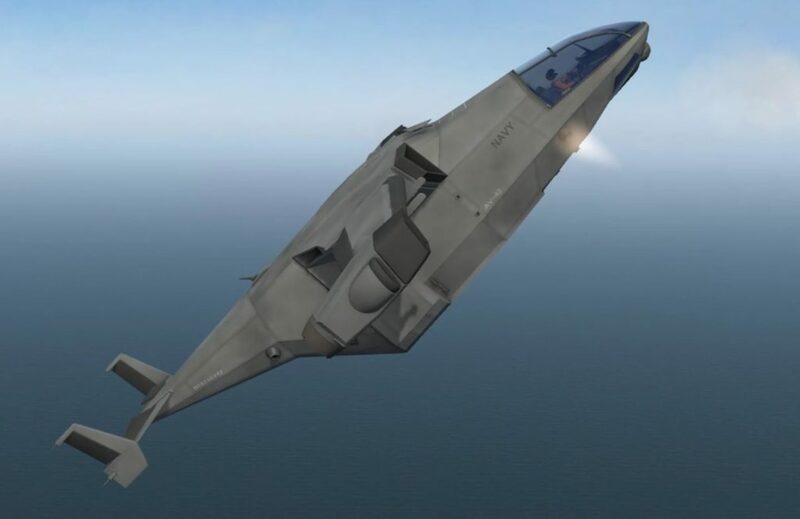 The Kestrel does have some kind of close-in air-to-air radar since it does have the ability to give a predictive gunsight when using the canon in close in dogfights, and it can also carry heat seeking missiles, but does not carry longer range, radar guided missiles. 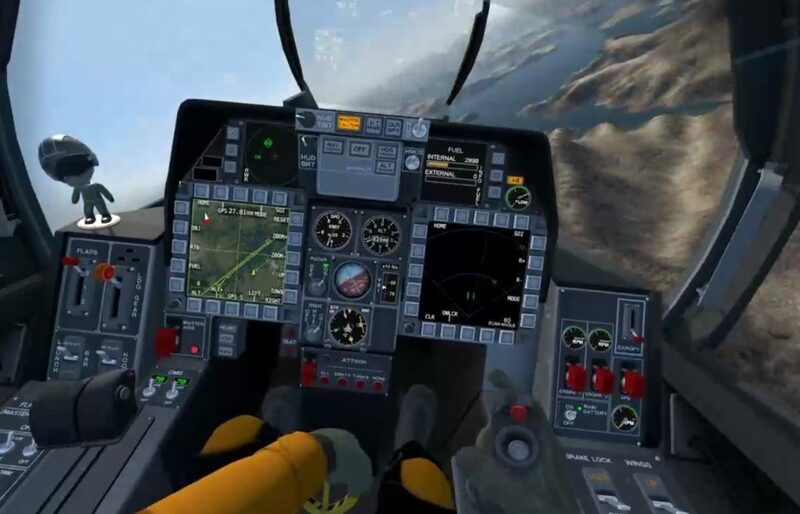 The cockpit of the F/A-26B fighter, with dual MFDs and the option for a side or center mounted control stick. 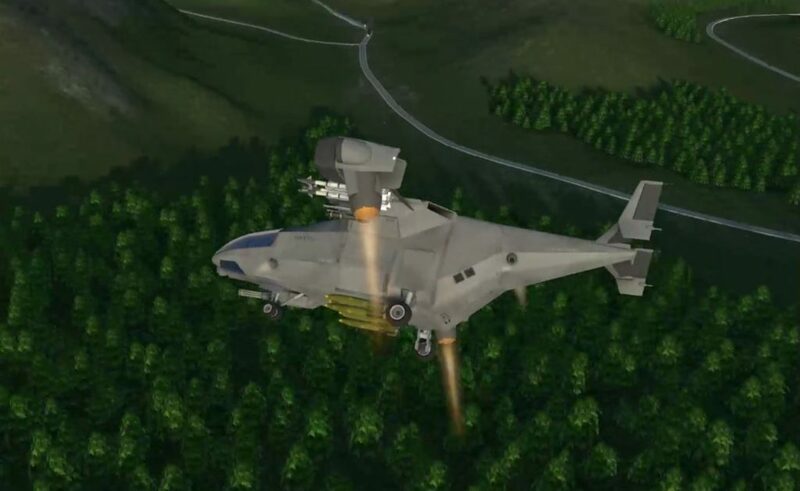 The VTOL AV-42C has three MFDs and a “pull for power” collective type stick mounted on the left side. 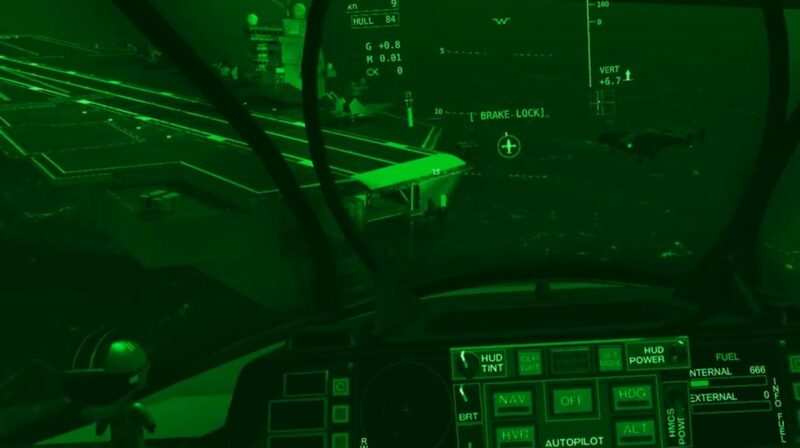 Both aircraft have helmet mounted visors that are capable of portraying night vision, Helmet Mounted Cueing System (HMCS) data, and sensor data from the TGP. 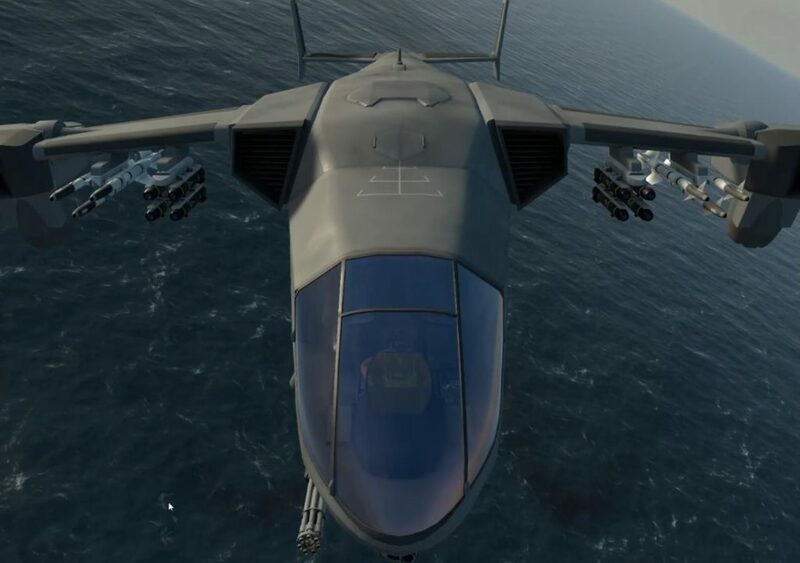 The helmet can also be slaved to IR missiles and (in the VTOL) the chain gun for off-axis firing. 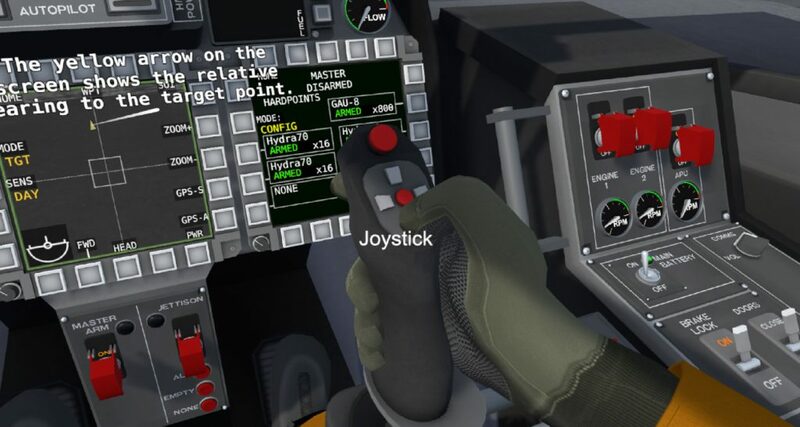 The HMCS is turned on and off with a switch on the panel, and the visor can be brought up and down by hitting another button on the panel, or by simply tapping the side of your head with your VR hand controller. 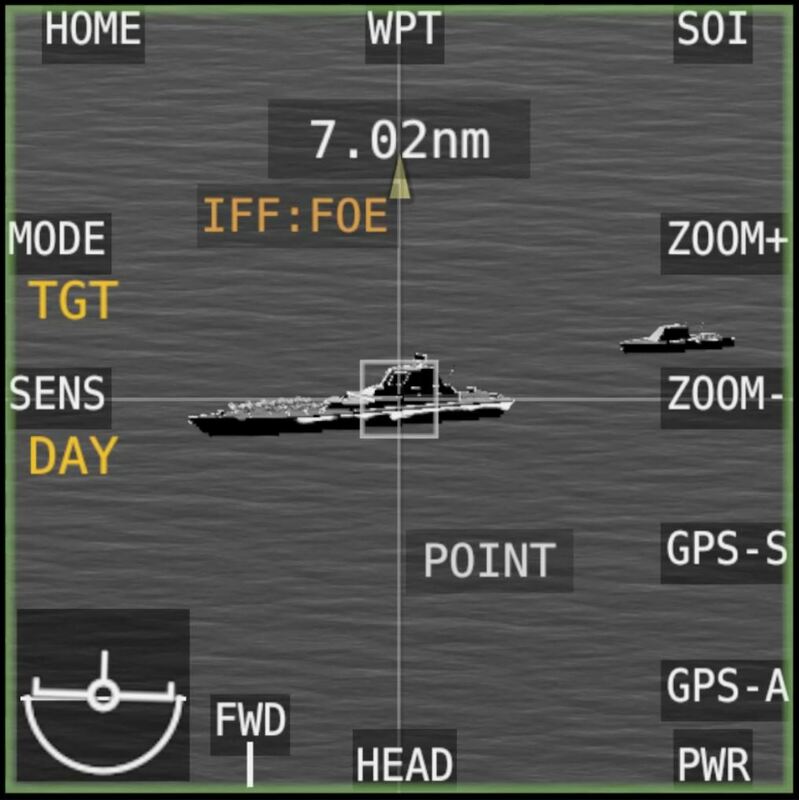 The combination of the HMCS and TGP when slaved together is an awesome tool for finding targets and designating them. 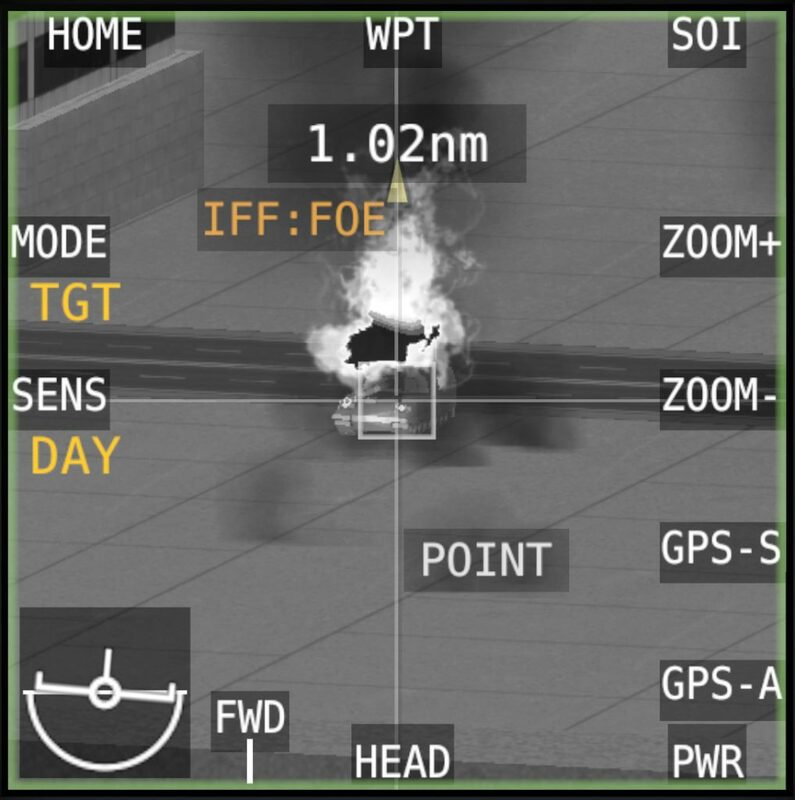 The TGP can use daylight optics, or white/hot or black/hot IR sensors to help locate targets. 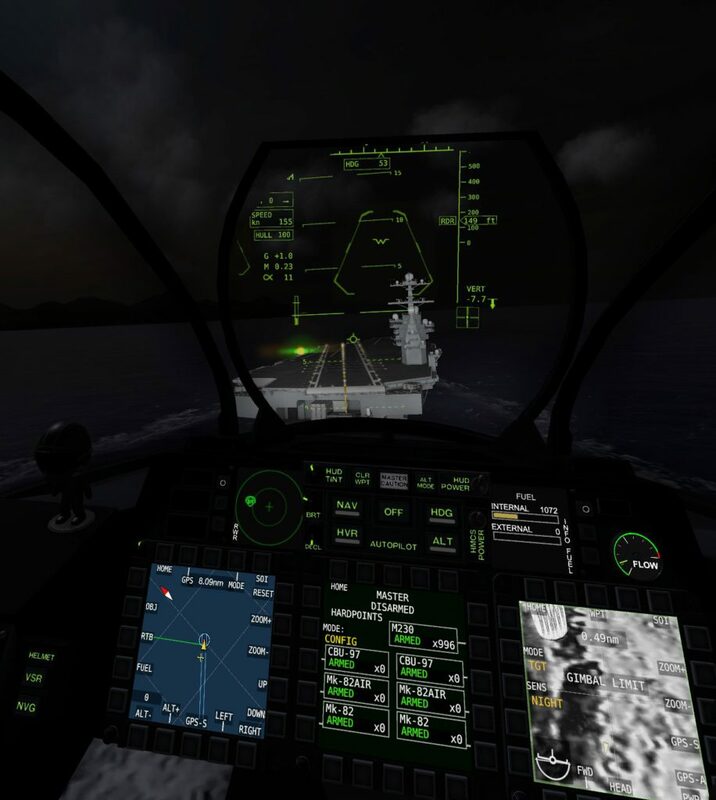 The HMCS directed TGP can also be zoomed in and out with the right controller buttons, and targets can be designated with another button. 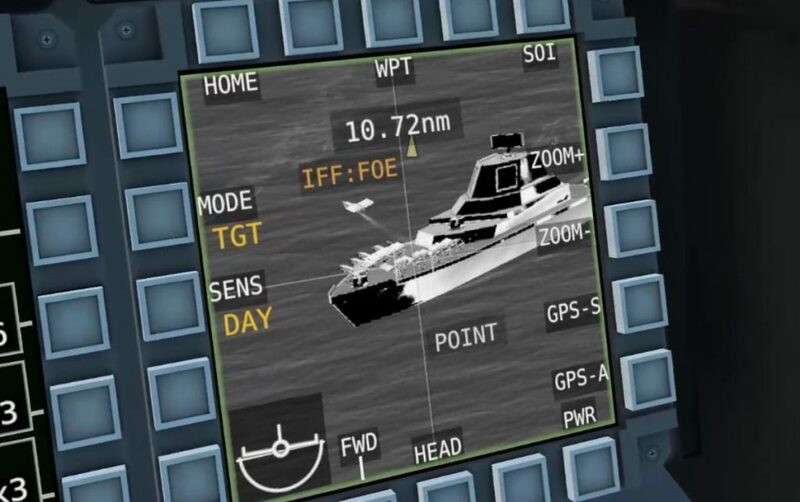 When not using the HMCS, the TGP can be made the sensor-of-interest (SOI) and moved with the thumbstick or pad depending on what type of VR controller you have. 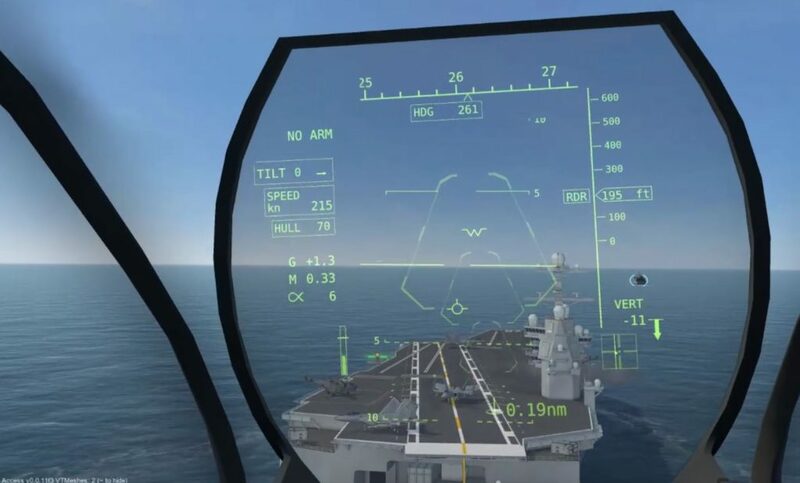 The HMCS is particularly useful in that you can see TGP imagery through the cockpit since the sensor is mounted externally. 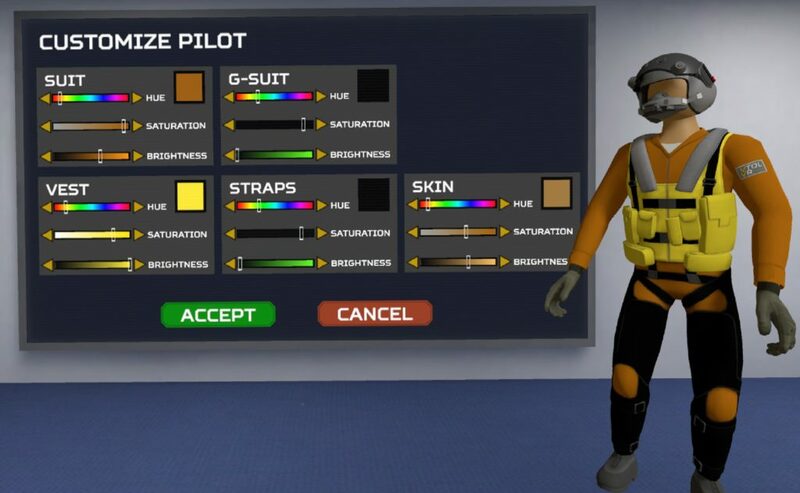 HUD and weapon release data can similarly be found outside the constraints of the HUD when using the visor since again, that data is being displayed on the visor. 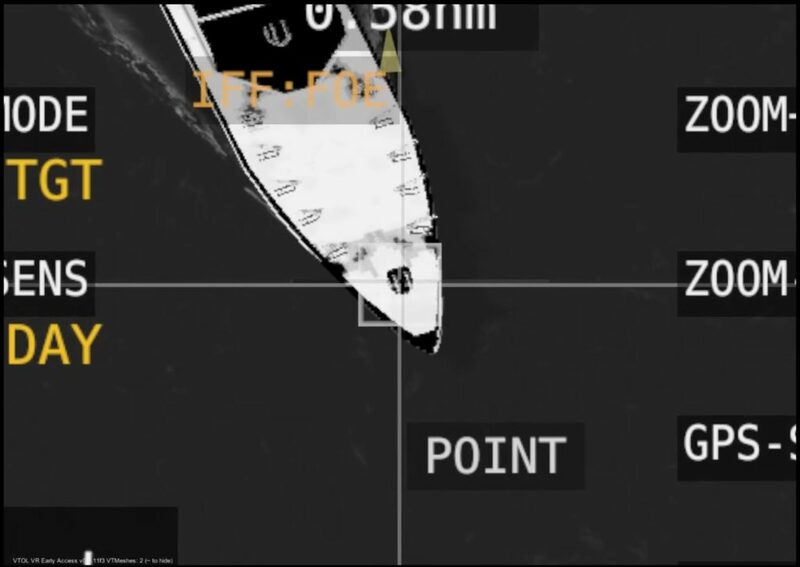 TGP imagery can be used to find and mark targets. It is stabilized, but does have gimbal limits that can be exceeded and airframe masking. 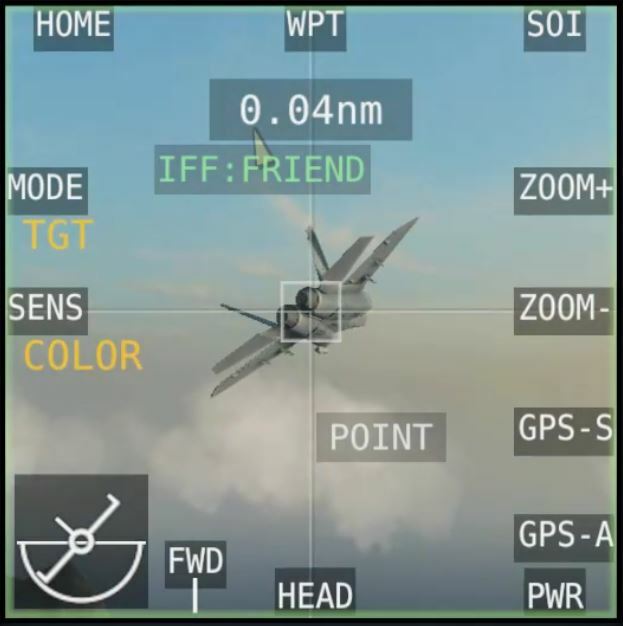 The TGP provides guidance for laser guided weapons, and target coordinates can be stored in target lists by hitting the GPS buttons. 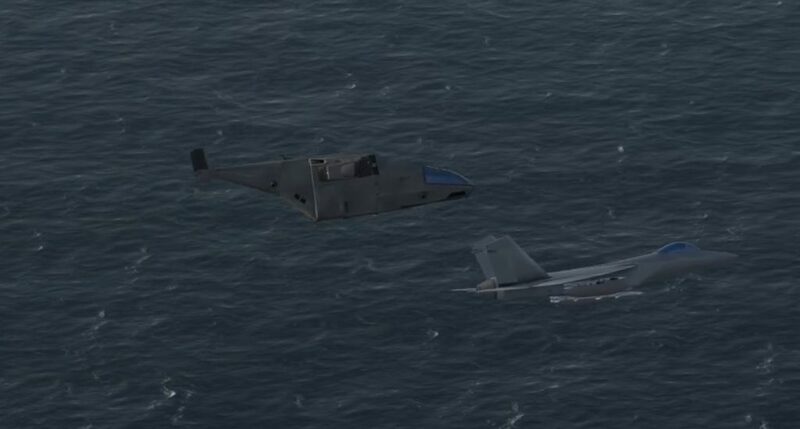 Both aircraft have Radar Warning Receivers that can detect air and surface threats, missiles launches, and missile tracking. 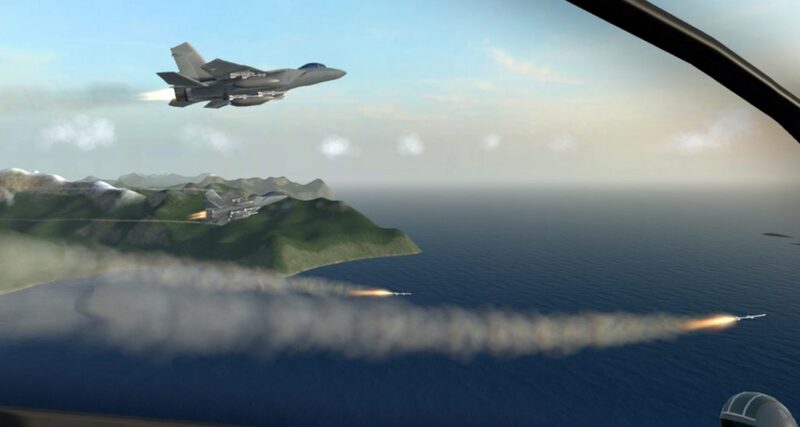 Beaming, chaff, and flares are all modeled and work as you’d expect – missiles can be defeated with maneuvering and counter-measures. 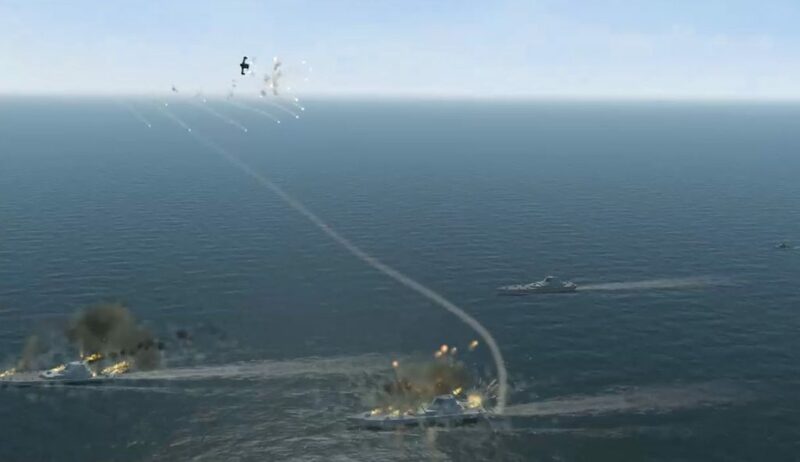 Anti-aircraft gunfire such as Close In Weapons Systems (CIWS) and machine guns are mounted on vehicles, ships, and some fixed emplacements. 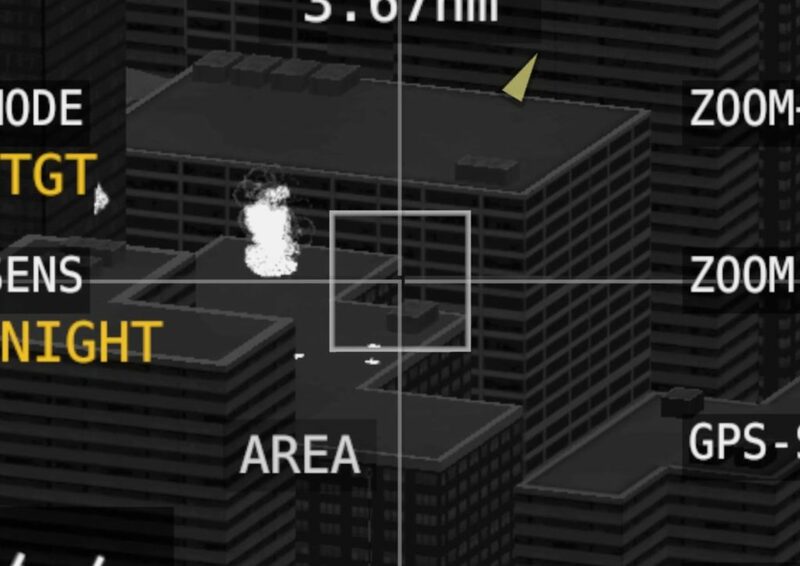 IR manpads must also be faced in the game, giving less warning, but still triggering the missile warning system. 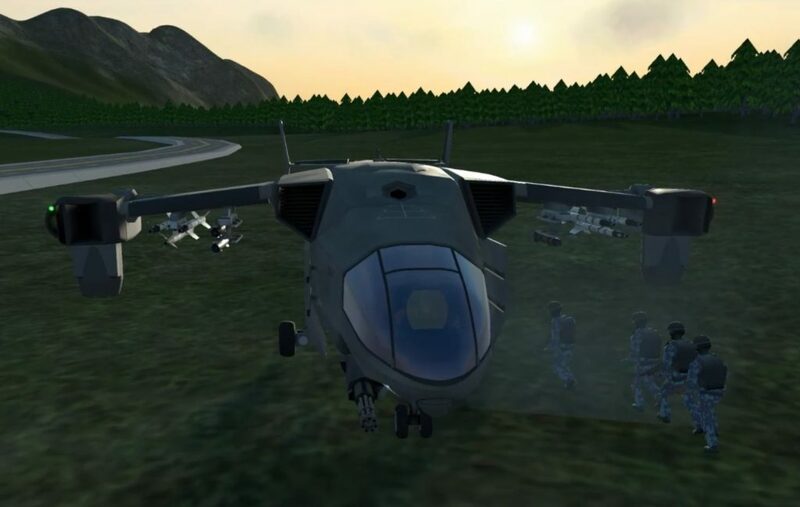 Perhaps one of the appealing things about VTOL VR is that it is rarely a mystery as to why you were shot down. 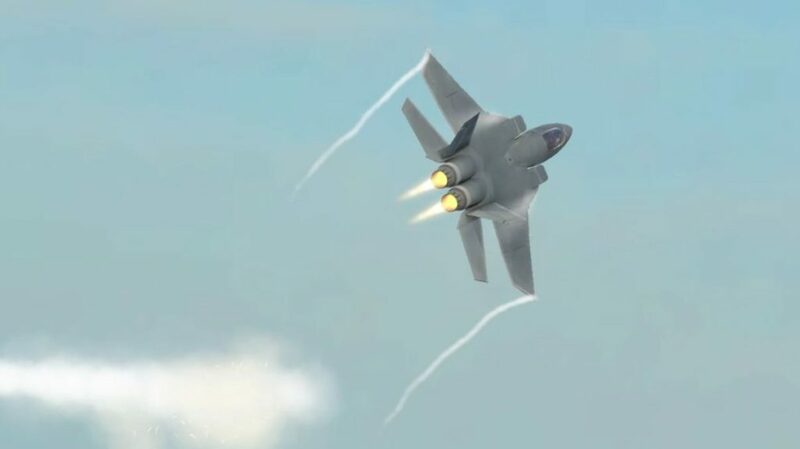 Surface-to-air missiles leave a persistent smoke trail that is easy to trace back to the source. 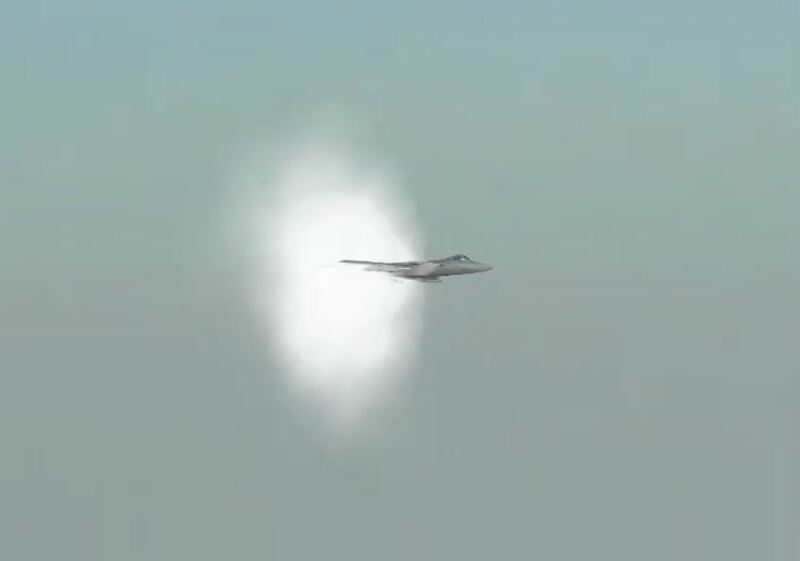 The smoke also allows for you to time evasive maneuvers. 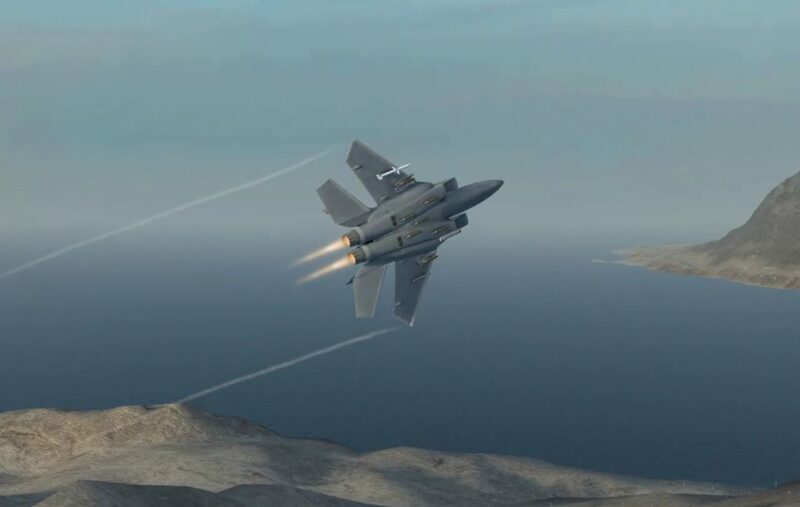 Once the missile motor extinguishes, missiles will continue to track you, so you do still have to be aware that missile could still hit you at the tail end of their range. 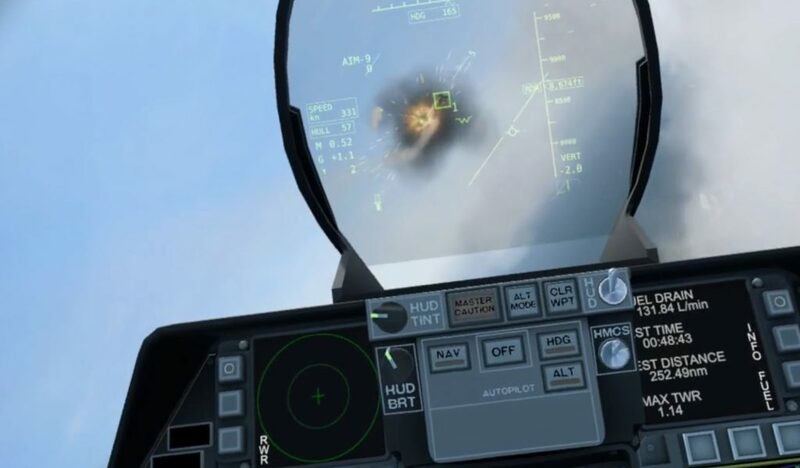 Radar guided anti-aircraft fire is similar in nature to what some of us combat sim would be used to seeing from a ZSU-23-4 Shilka (Zeus) – a stream of bullets that can be avoided if you keep maneuvering the aircraft. Head-on attacks, or flying without jinking is a recipe for disaster. 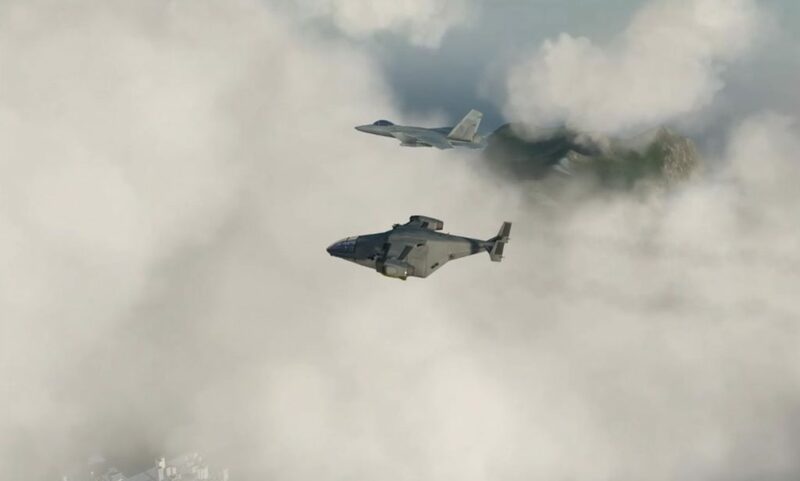 Both vehicles can utilize air-to-air refueling, and in some missions that will be a requirement. 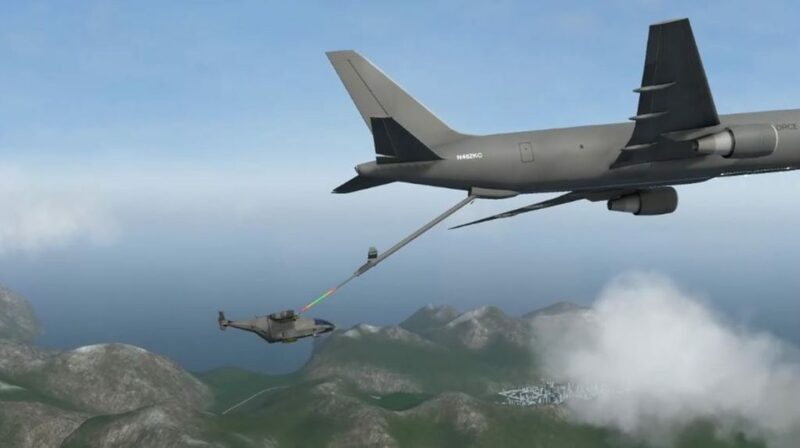 The tanker uses a boom system to refuel and is as simple to use as opening your fuel door and sliding up into position. 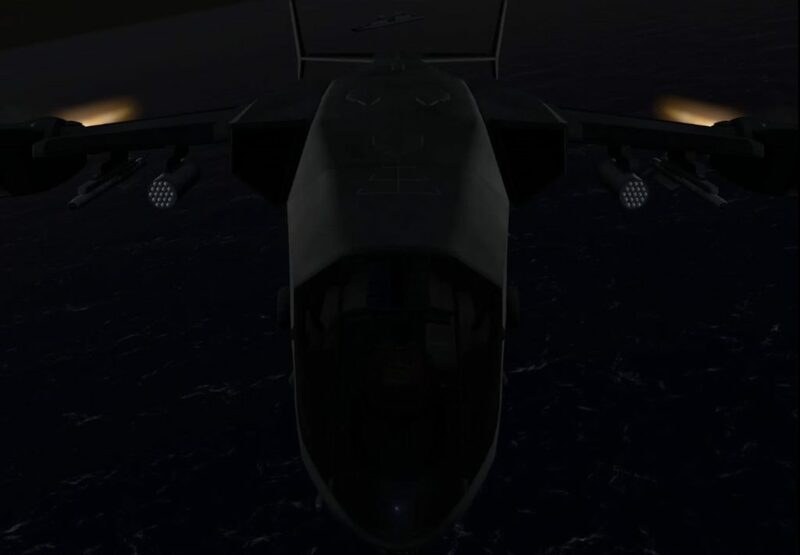 Fore/aft/high/low director lights are located on the bottom of the tanker and provide guidance on where to fly to receive fuel. If you are in a good position, the tanker will plug in and fuel will flow. From near empty to full only takes about 50 seconds in the AV-42C. 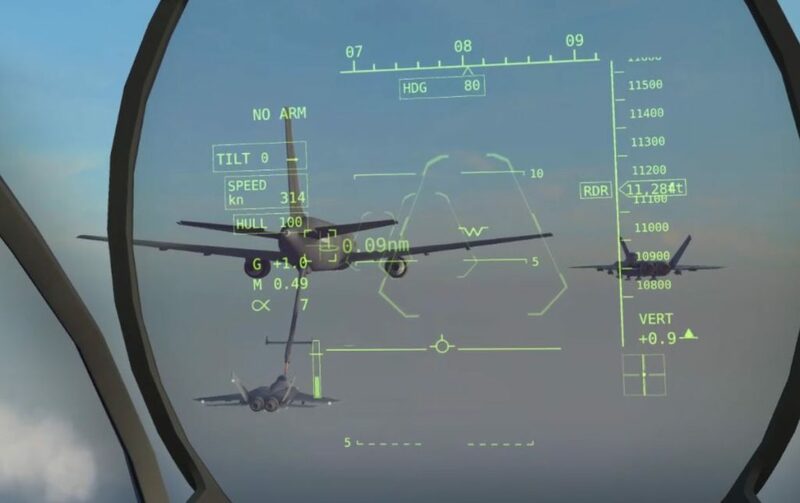 The precision flying required for tanking is, in my opinion, even more natural and intuitive than in other sims with traditional hardware controls. 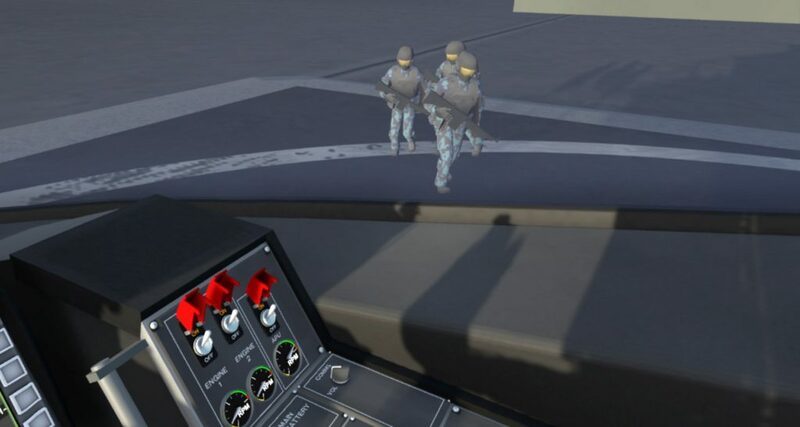 In some missions, you will be required to wait for your wingmen to tank. 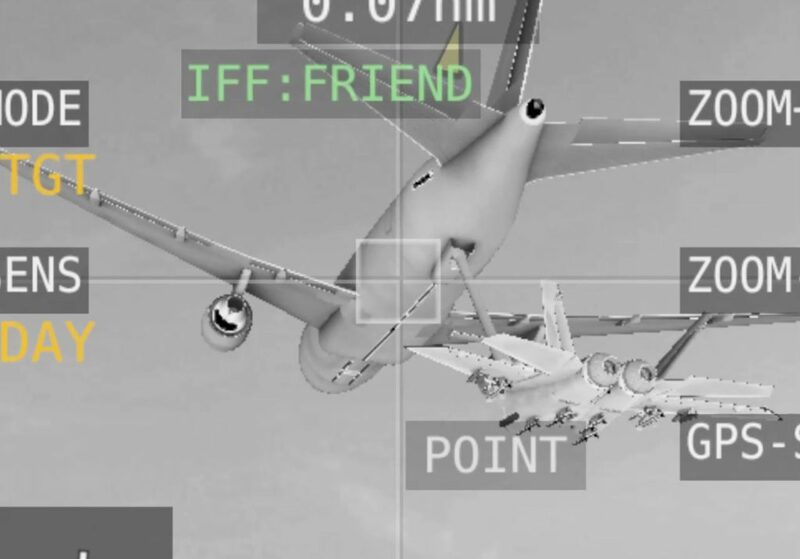 As well, you can return to the tanker for additional fuel if your mission requires it, and you can send your wingmen to tank if you think they need it. 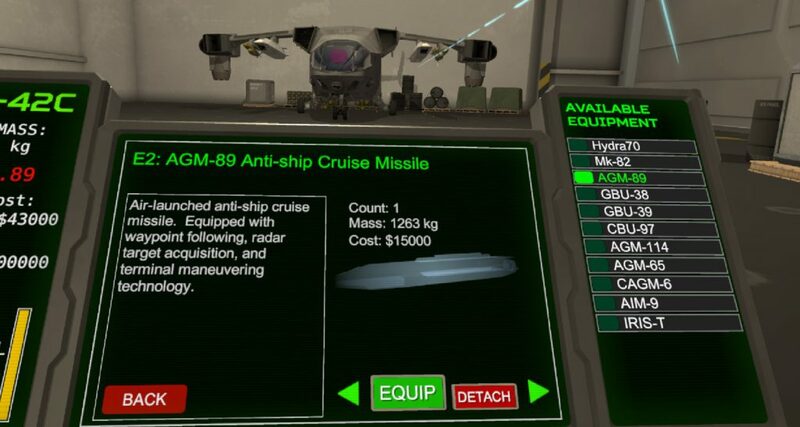 The weapons inventory for both aircraft has been expanding as the developer has added capabilities. Weapons range from simple gravity fall bombs to precision laser and GPS guided bombs, self guiding active seeker missiles, anti-radiation missiles, cluster bombs, rockets, and many others. 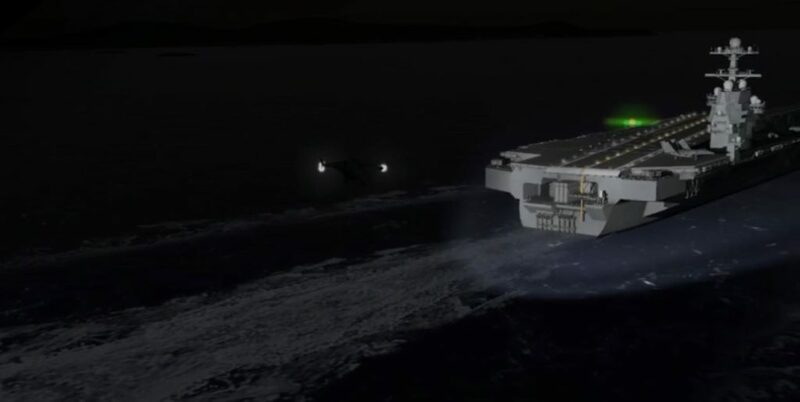 At the start of the mission (unless the mission designer has given a required loadout) weapons are loaded in a hangar bay. 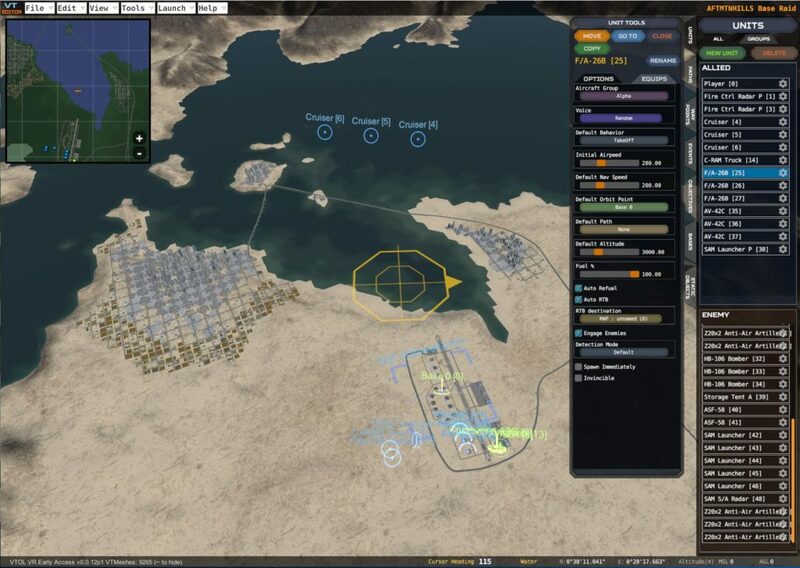 A budget is set by the mission designer and care must be taken to select weapons that will be effective, but also allow for the quantity of targets to be hit. 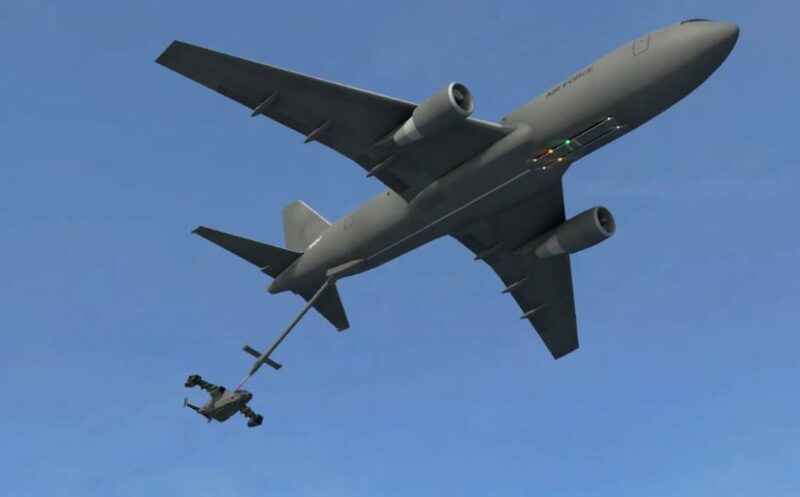 Mid-mission rearming and refueling may be allowed, so keep some funds in reserve for reloading. More capable and powerful weapons are usually more expensive. Some weapons can be configured with multiple numbers on racks depending on the station. 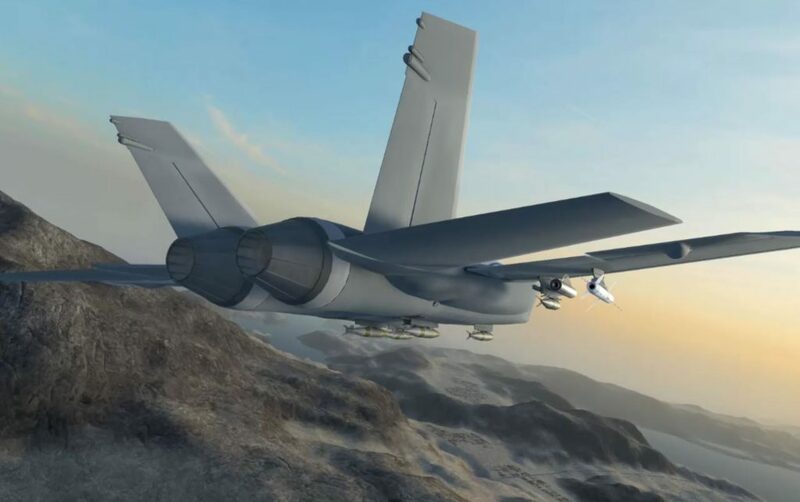 Some weapons will require a targeting pod to designate with. 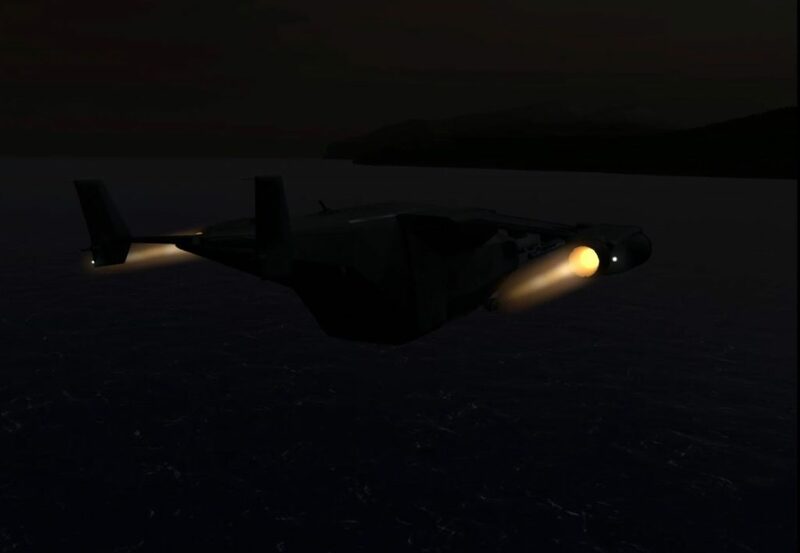 Fuel and weapons loads affect the overall thrust-to-weight ratio (TWR) and can prevent vertical takeoffs in the AV-42C. 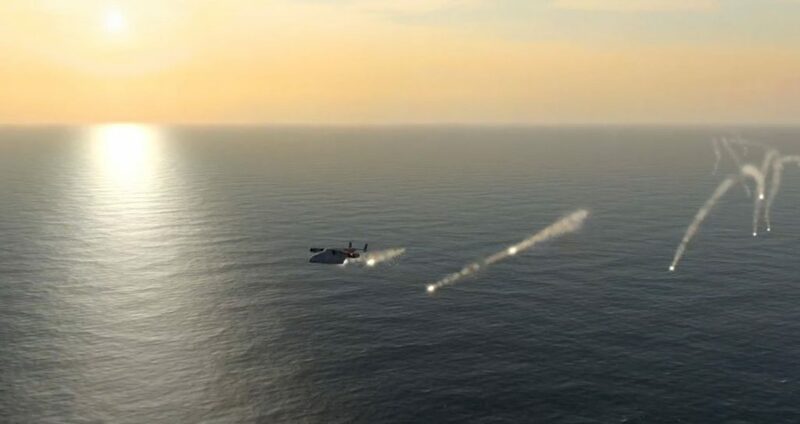 Fuel may be available from tankers, land bases, or aircraft carriers, so read the mission notes carefully. Weapons modeling seems quite good with constraints and ranges accurately modeled. 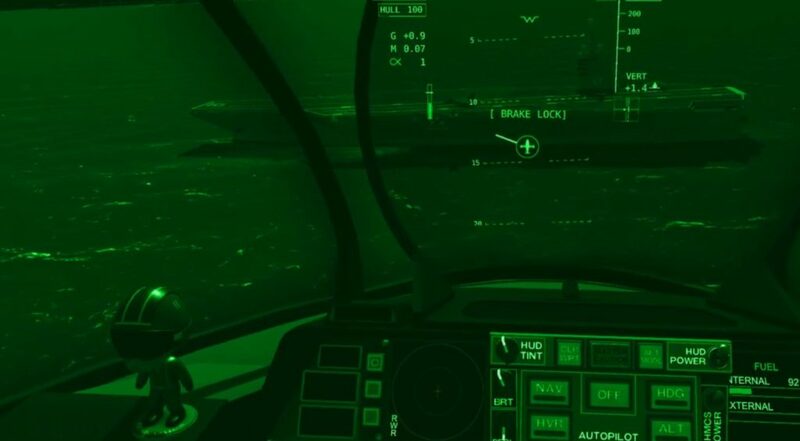 For example, the Hellfire flight time at maximum distance seems to match published numbers, and the laser designation must be kept on to assure a hit. 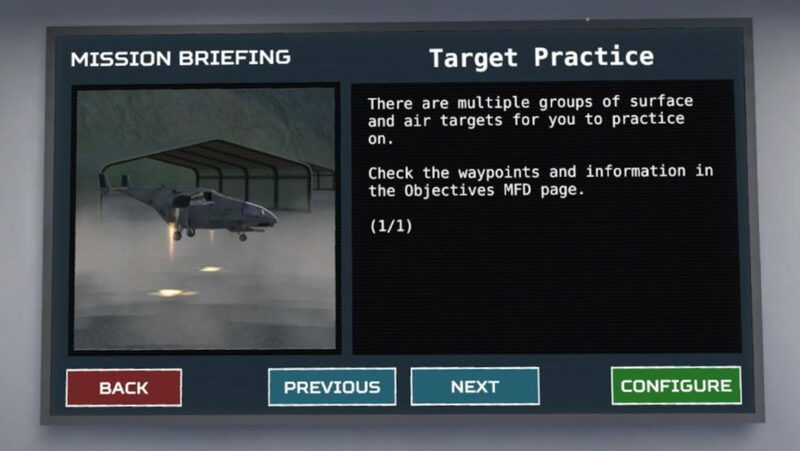 Advanced weapons such as the GPS guided bombs can be ripple fired after building a GPS target list, allow you to use the TGP to build a target list from afar, then drop multiple weapons on a single pass. 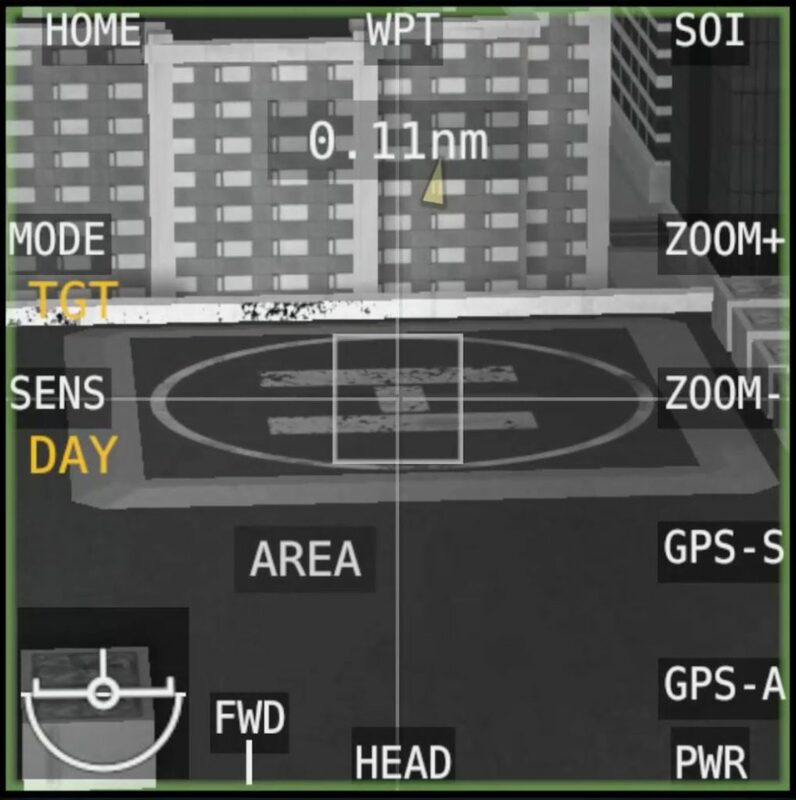 A group (GRP 1) of GPS targets created by tagging each location using the TGP. 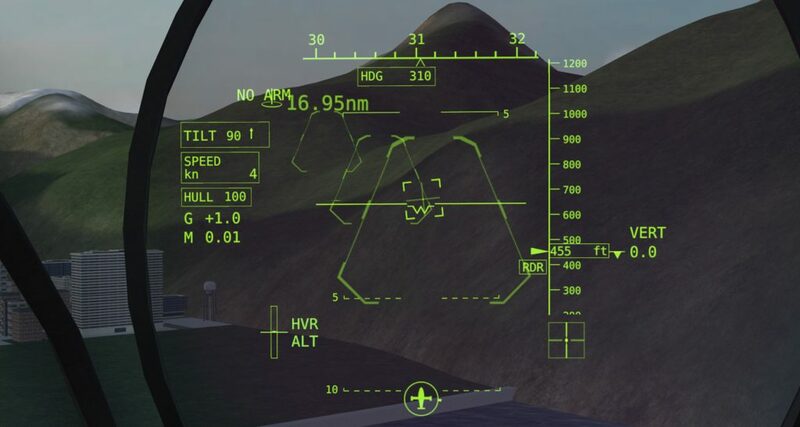 Missile range data is shown on the right side of the HUD using a Dynamic Launch Zone indicator with a carrot indicating where you are in the missile envelope with no-escape, max and min ranges, and a weapon release light and tone. 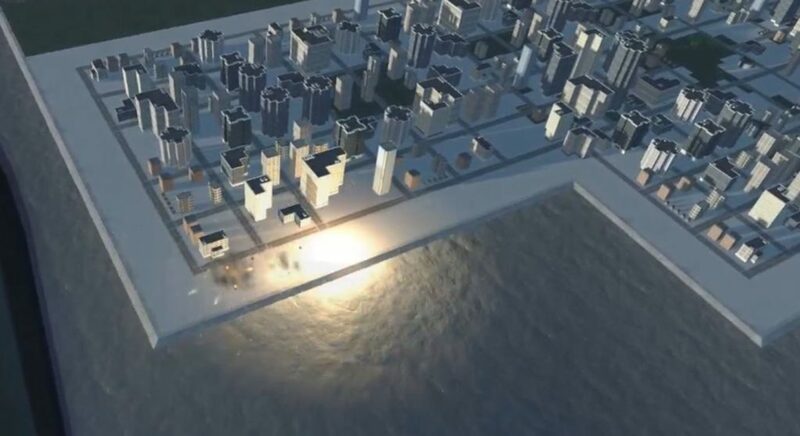 Bombs can be delivered by GPS, laser guidance, or free-fall CCIP. 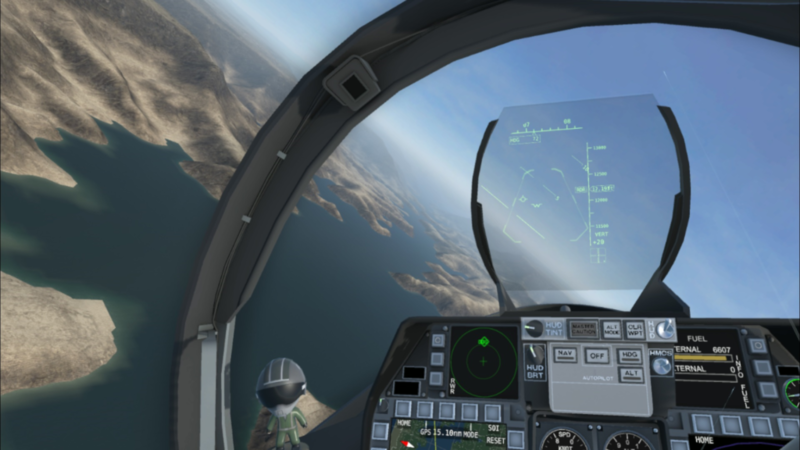 Level bombing is possible when using the helmet visor since it displays the bomb fall line through the cockpit visual constraints. 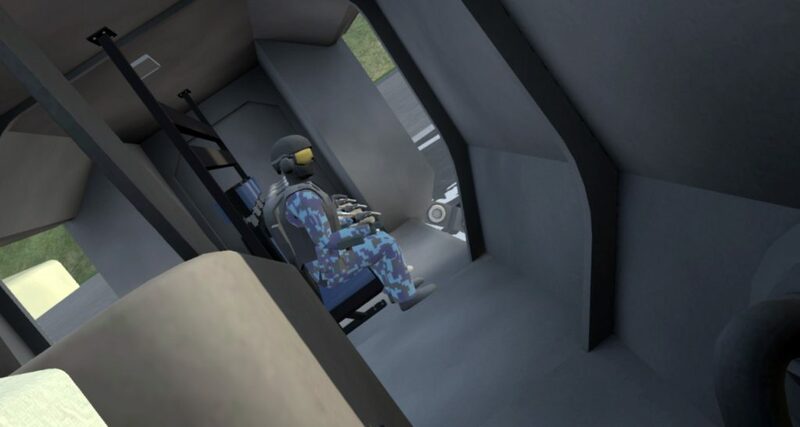 A minimum altitude release staple is also shown on the bomb fall line to prevent frag damage from releasing a weapon at too low an altitude. All of these modeled items are a clue that this is a fairly deep simulator – one that surprises people as they explore it more. 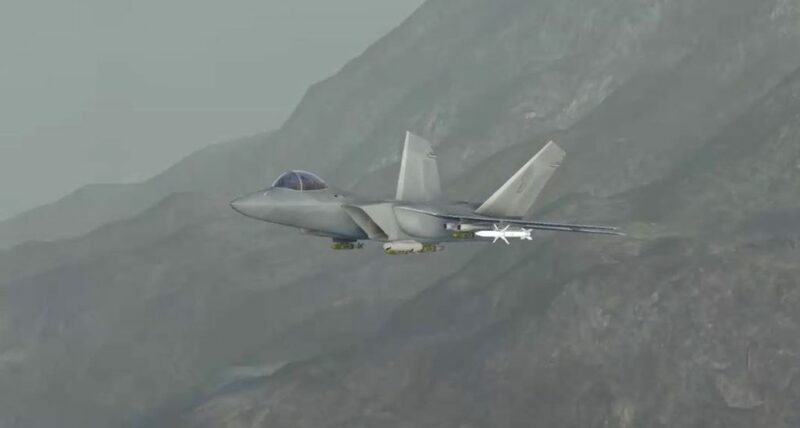 The long range cruise missiles (AGM-89 and AGM-161) are an interesting weapon due to their advanced programming capability. 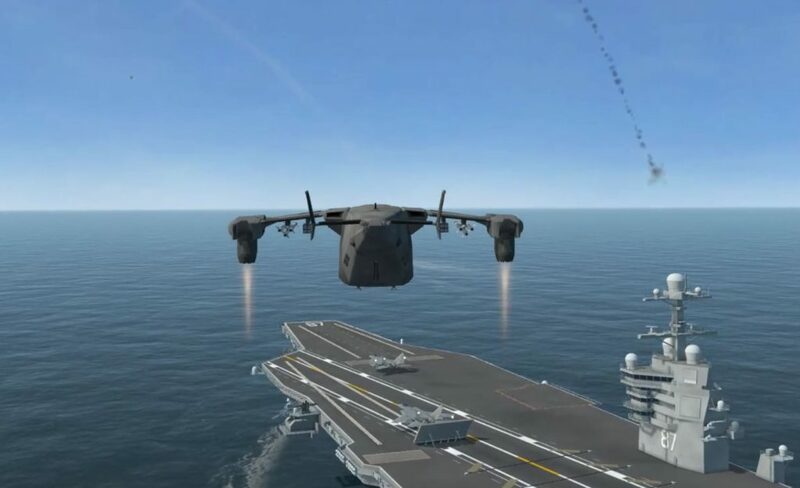 These missiles are designed for long range attacks against ships or static ground targets. 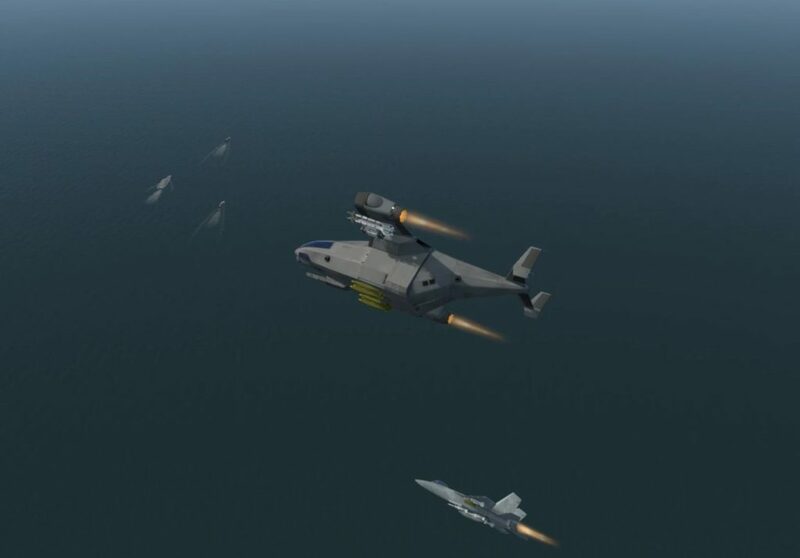 The AGM-89 can be programmed to fly a series of waypoints to the target, and the terminal attack phase can be set to direct, pop-up, or evasive sea-skimming modes. 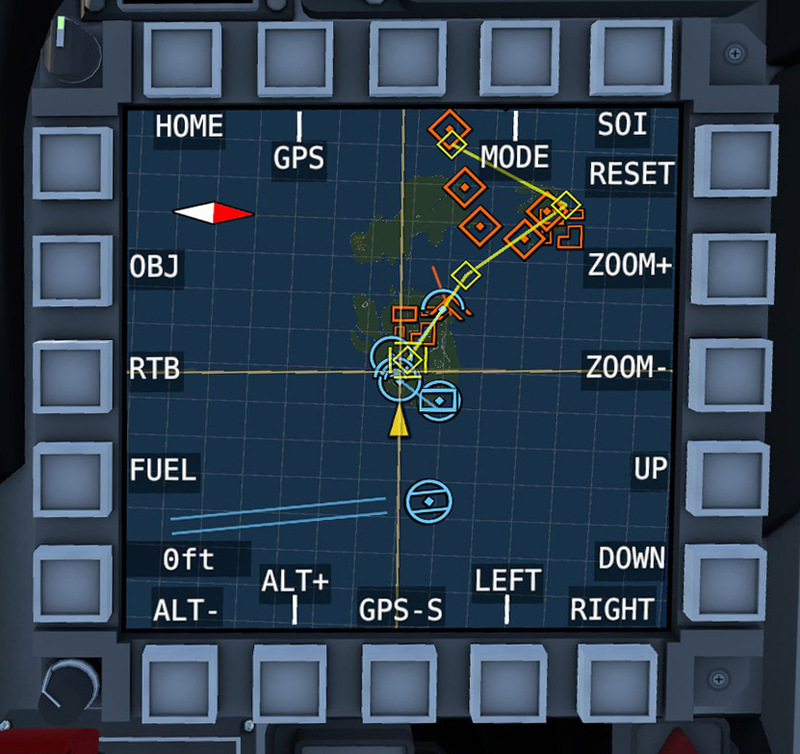 Creating a GPS path for the cruise missile to follow on the way to the target. This can help the missile avoid anti-missile Close-In Weapons Systems (CIWS). 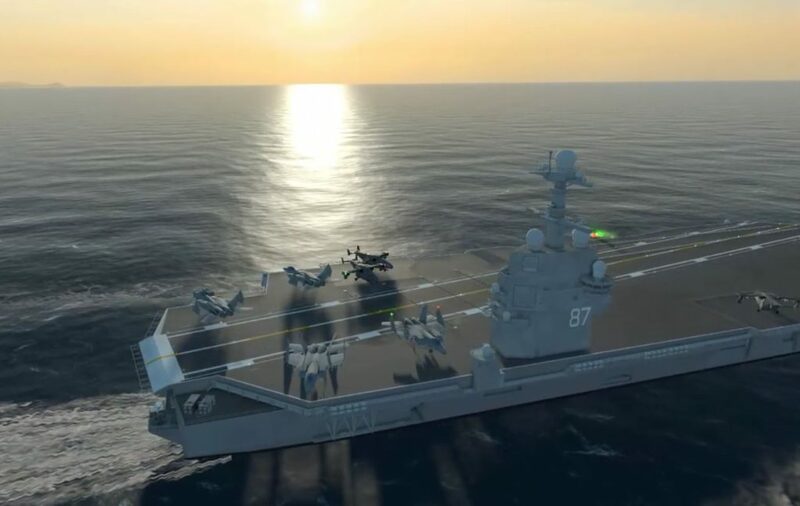 Long range missile shots will be vigorously defended by ships with their surface to air missiles and CIWS. 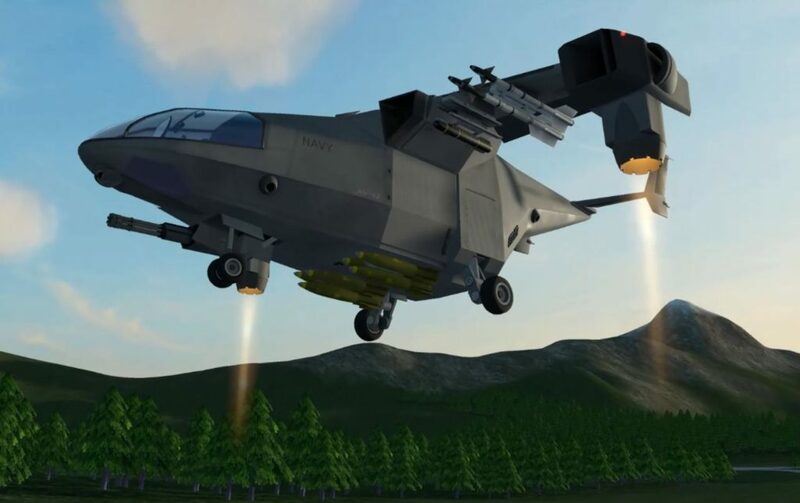 A good technique is to target their weapons platforms and radar before you go for the kill – but they won’t make it easy for you since they will be lobbing missiles back at you too! 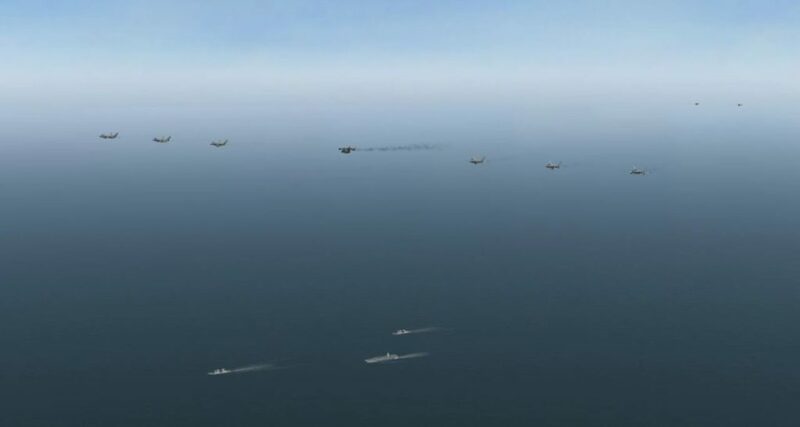 Similarly, your fleet (if the mission features one) will also defend itself with a barrage of missiles and gunfire – it makes for a spectacular sight! 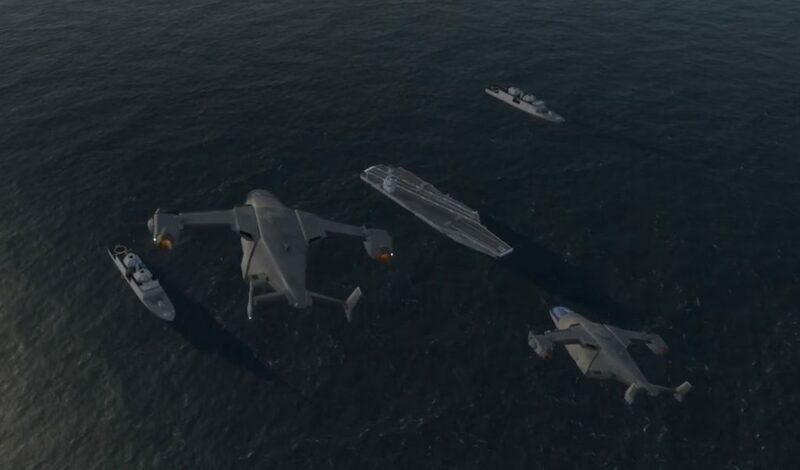 The drone launching destroyer can launch up to 10 Manta UAV drones to ruin your day. 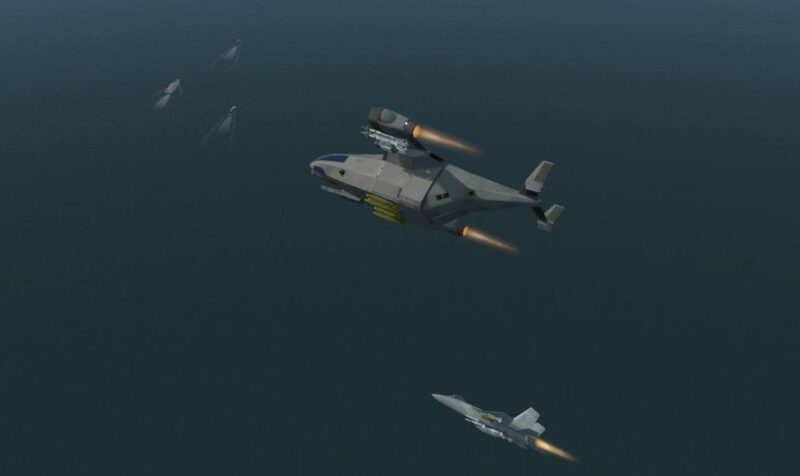 Targeting the enemy anti-aircraft missile launchers is a good way to de-fang the larger ships. 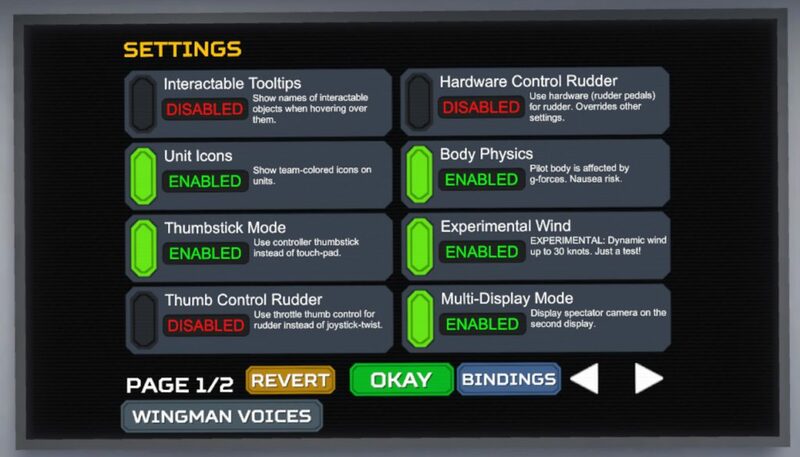 The sim comes with a good set of tutorial missions to come to grip (literally) with the hand controller system of flying. Many skeptics will only give up their traditional hardware controllers if you pry them from their cold, dead hands, and I get that. 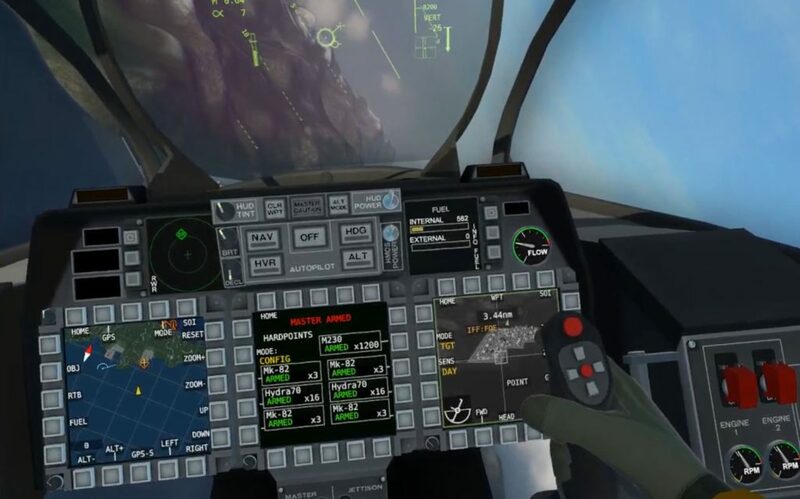 You will be surprised, however, at how natural and quickly you adapt, and how quickly you can perform other cockpit functions using the hand controllers. 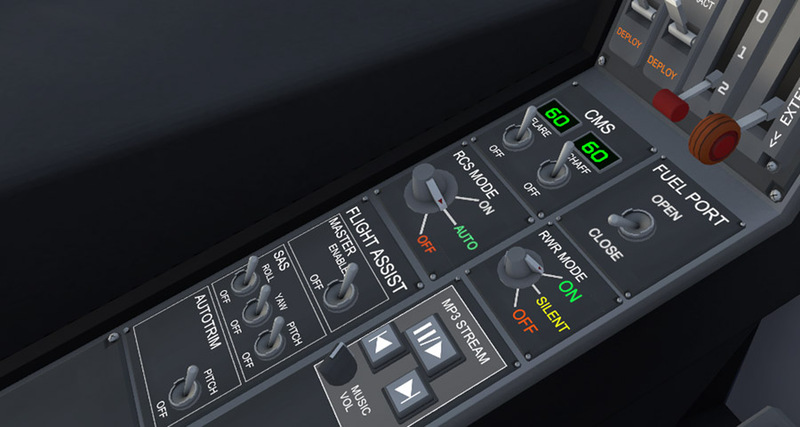 The left (throttle or quasi-collective) and right (stick) control locations can be adjusted with buttons in the cockpit so that they find a natural “neutral” spot in your real world. 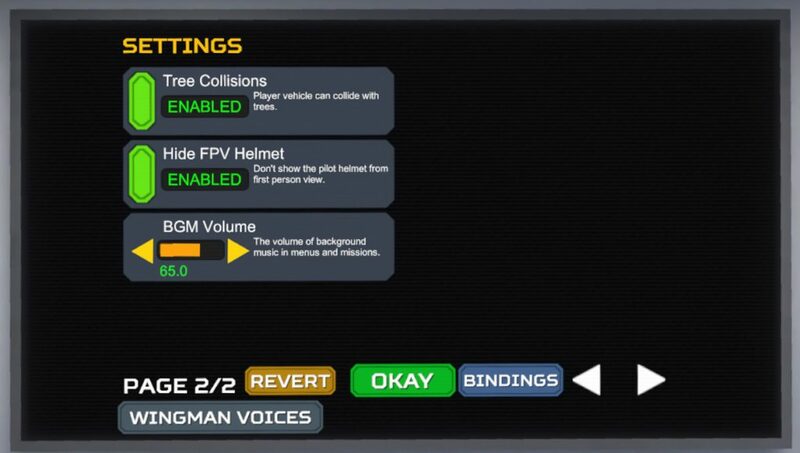 There is even an “auto” function that locks your hand to the throttle while you find your comfortable spot, and then you can set that as your “zero”. Personally, I think it is almost essential to have a chair with arms on it to provide a nice place to rest your forearms. I absolutely love the control scheme. 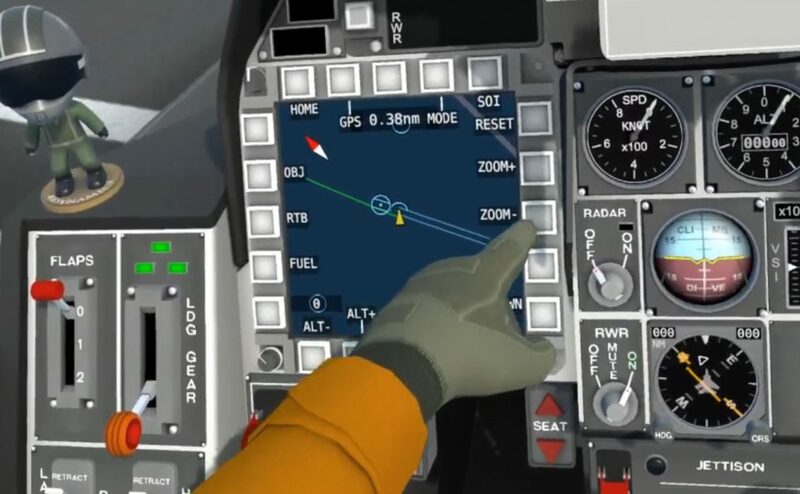 Users with lighthouse type / external controller sensors probably have an advantage over “inside out” type tracking because your hands will sometimes drop out of view as you crane your neck around behind you. Users with inside-out tracking quickly adapt to using quick glances. 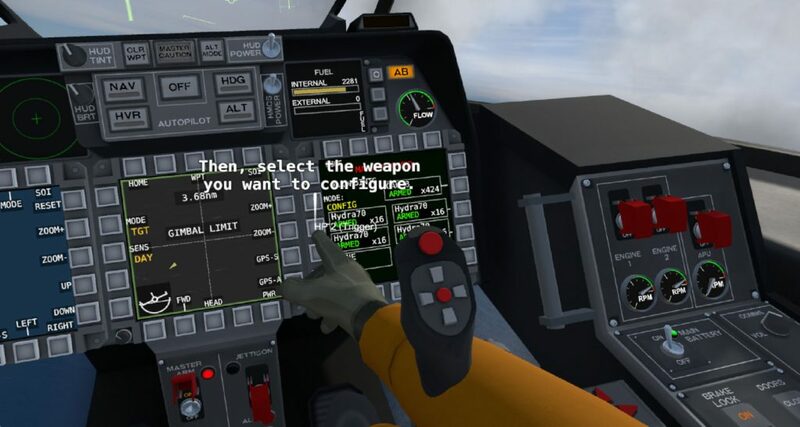 The tutorials cover basic aircraft operation, some basic flight and weapons use. The tutorials could probably be much more in depth, but they get you on the path of exploration. 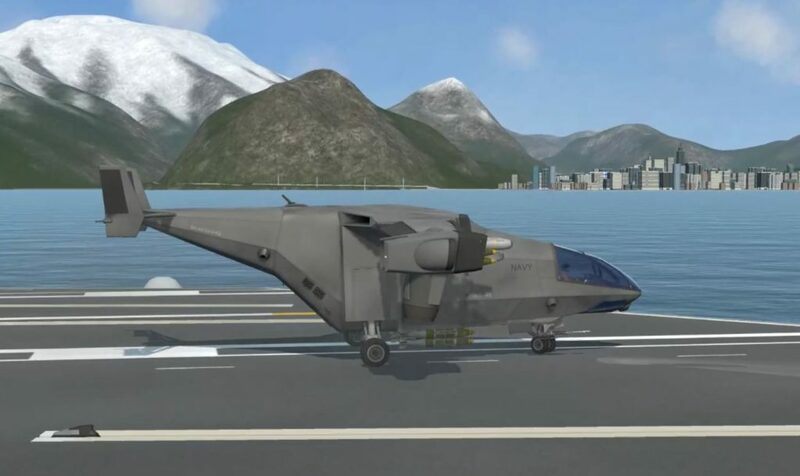 The AV-42C VTOL can, if the thrust to weight ratio (TWR) allows for it, take off vertically. 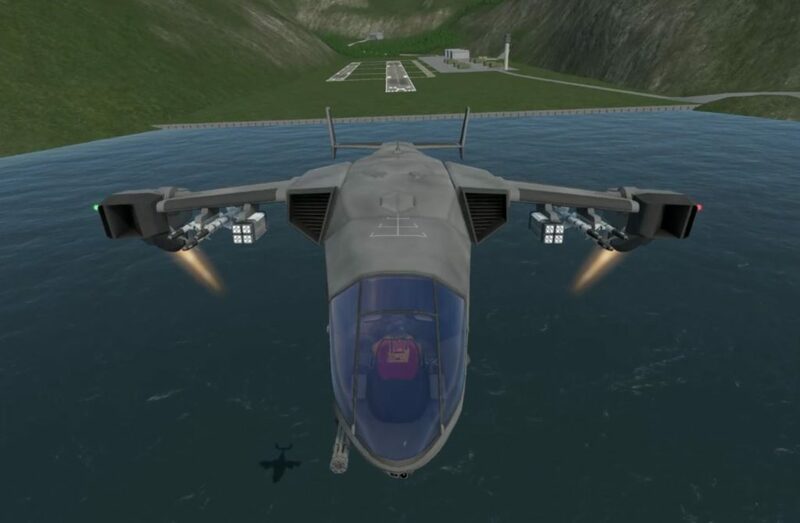 If you exceed the hover TWR, you can use a catapult launch from the carrier, or a traditional or short-takeoff from the land base. Catapult launches are fantastic fun. The F/A-26B features canopy hand holds and a CATO takeoff trim setting that allows you to just add the power and it pitches the plane at the end of the cat stroke. 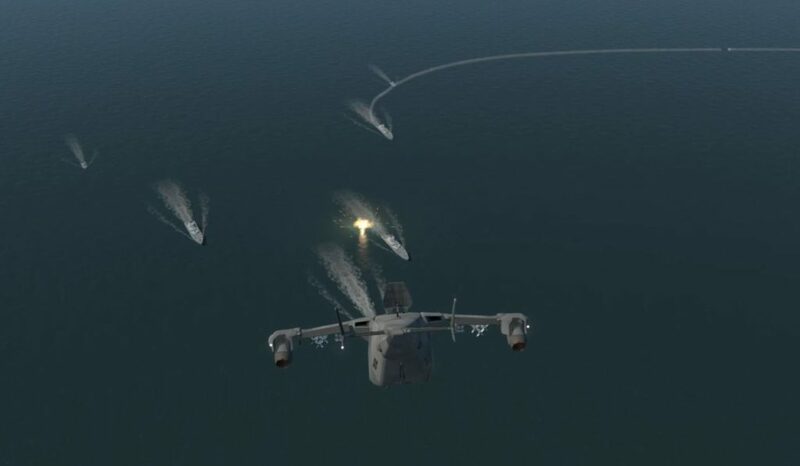 Carrier landings are supremely entertaining. 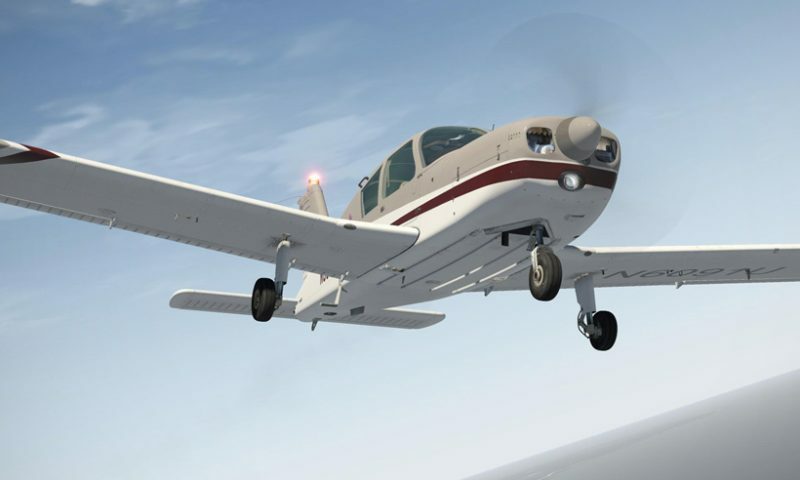 The planes respond to the controllers very precisely, and a trigger on the throttle controls a speedbrake on both vehicles. 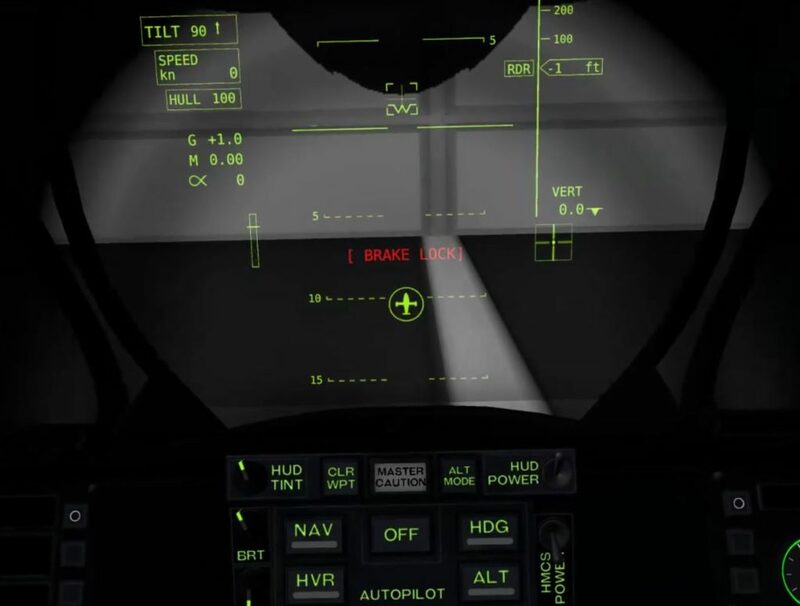 Flaps, gear, hook, and roll into the groove behind the carrier. 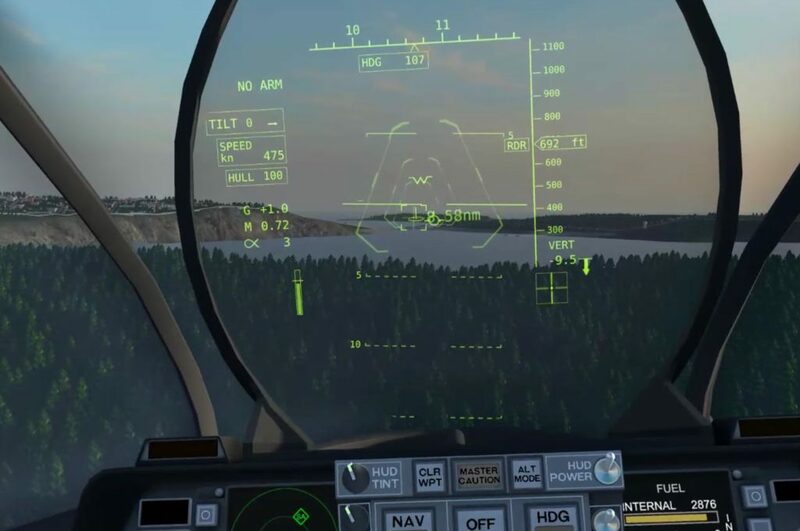 The Optical Landing System for glideslope is bright and easy to see from a good distance out on final. 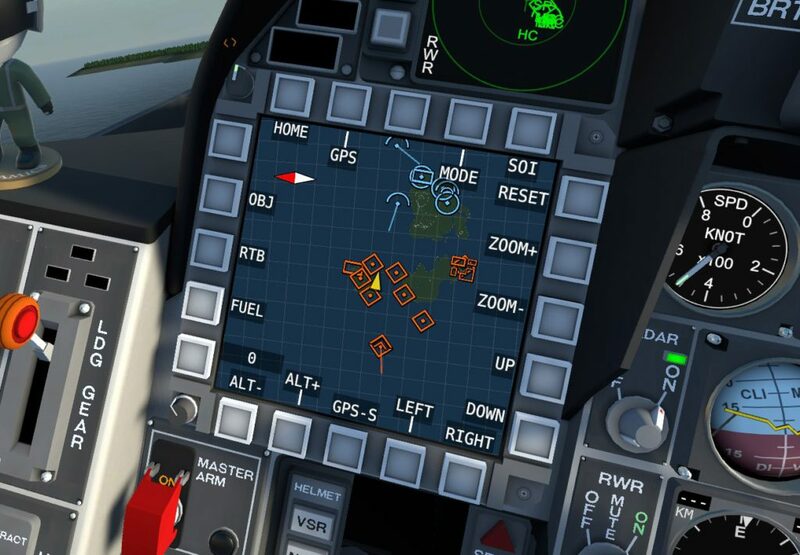 A pathway on the NAV MFD page also provides a good lineup path for the approach. Keeping the ball centered is pretty easy and you’ll be rewarded with a thunk and trap, or a bolter if you screw up. 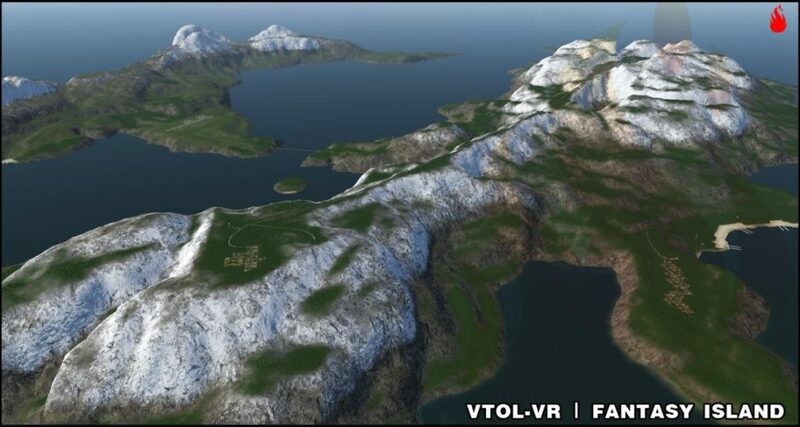 All the while, other fighters and VTOLs are taking off and landing, providing a very impressive and immersive environment. 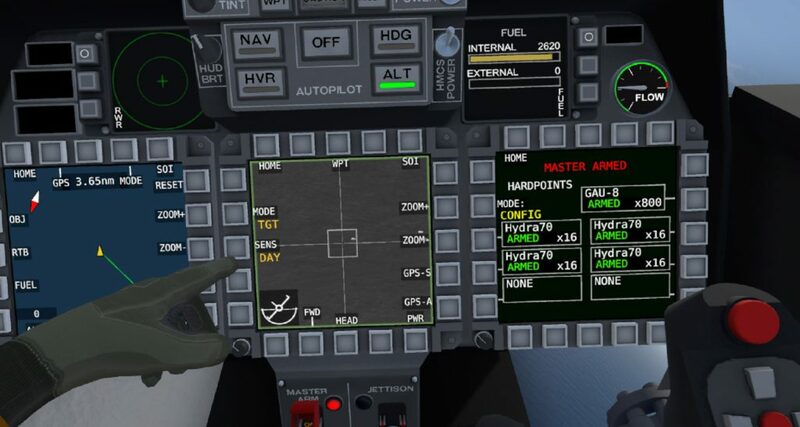 Autopilot modes include HDG hold, NAV slave, ALT hold, and in the AV-42C, HVR (Hover) hold. 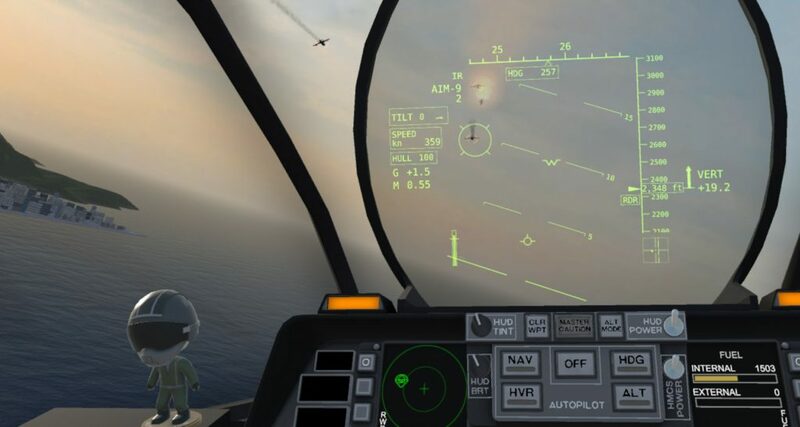 The autopilot is a great tool for maintaining a stable orbit outside of the enemy engagement range while you search for targets, populate a GPS target list, or perform some reconnaissance. 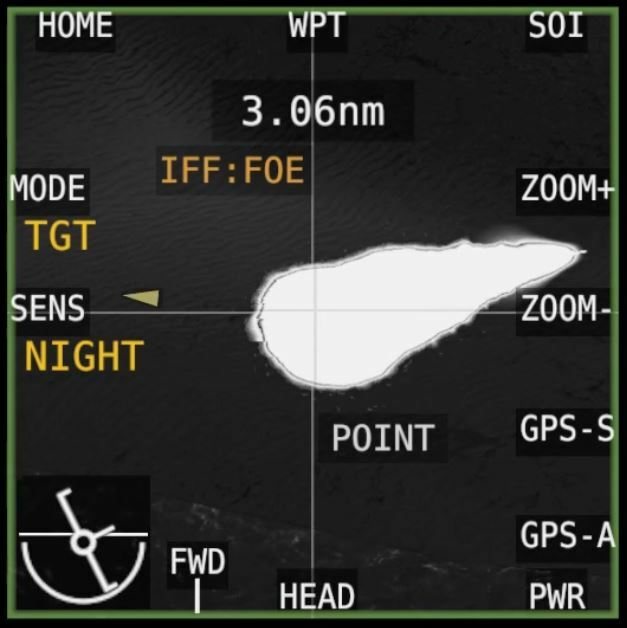 The multiple modes of the TGP (Color / Day / Night) make it easy to spot hot targets against cooler backgrounds. 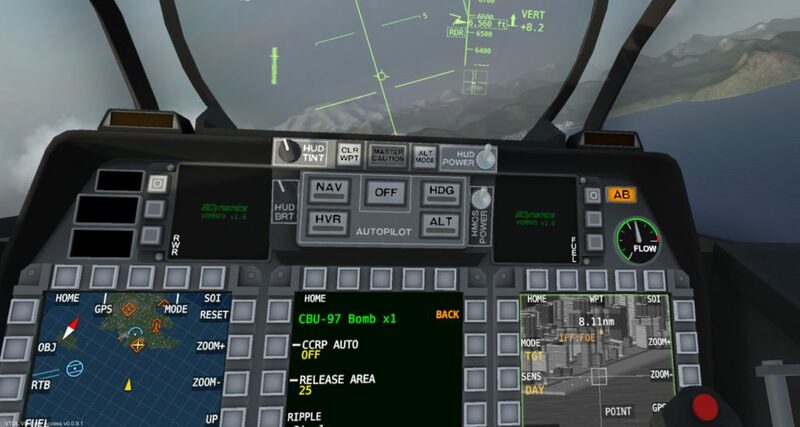 Keep in mind that hovering (both when using the autopilot or not) requires a large amount of power and you may be cycling in and out of afterburner to do so, consuming a larger amount of fuel. This is particularly important if you are returning with minimum fuel to a base or location where you must hover to land. 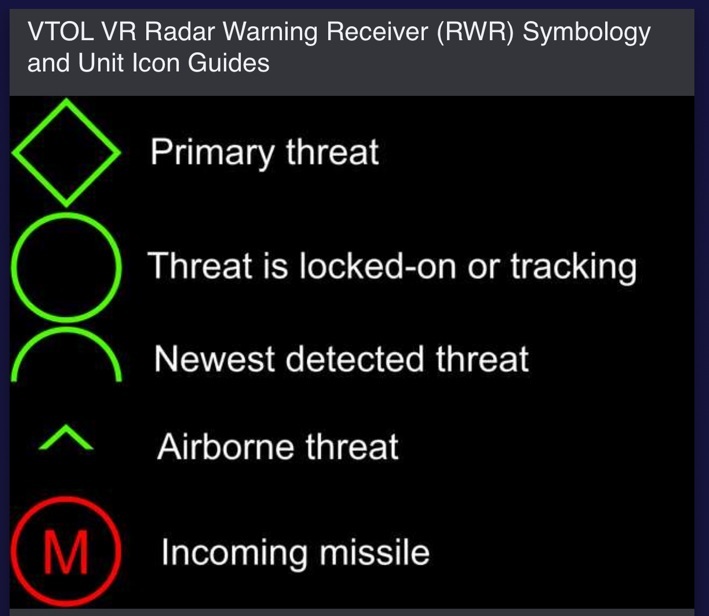 A good example of the surprising complexity is the Radar Warning Receiver (RWR) modeling with specific radar threat labels. 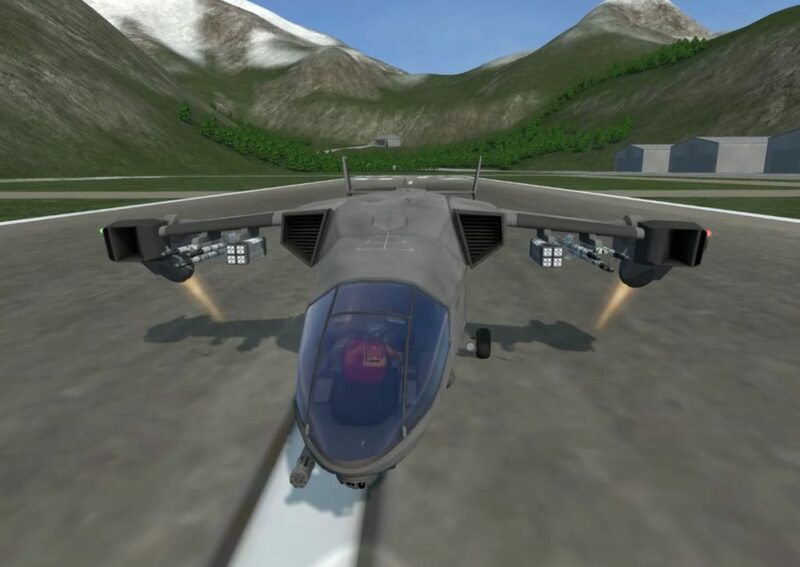 Flight modeling is extremely good. I don’t know what technique or what underpins the aerodynamics and physics model, but it is very good. The transition from hovering flight to forward flight by gradually tilting the nacelles and feeding in some aft stick is very well done. The AV-42C features Reaction Controls using thrusters that enable yaw and pitch at low speeds. Flight Assist controls include roll, yaw, and pitch Stability Augmentation Systems (SAS) as well as pitch auto-trim. The auto-trim is useful in that the system attempts to keep your pitch near the same once you go hands off the stick. Any amount of roll input though, will result in a tendency for the nose to want to sink a bit. 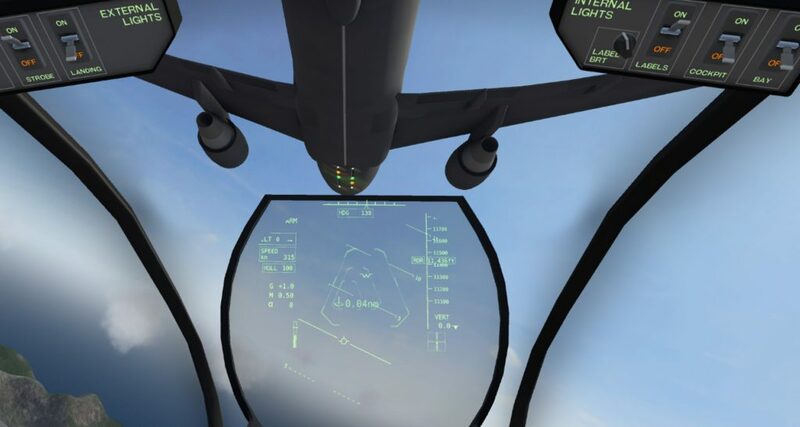 So you can think of it as a pseudo-Airbus type control, but not as useful in roll. 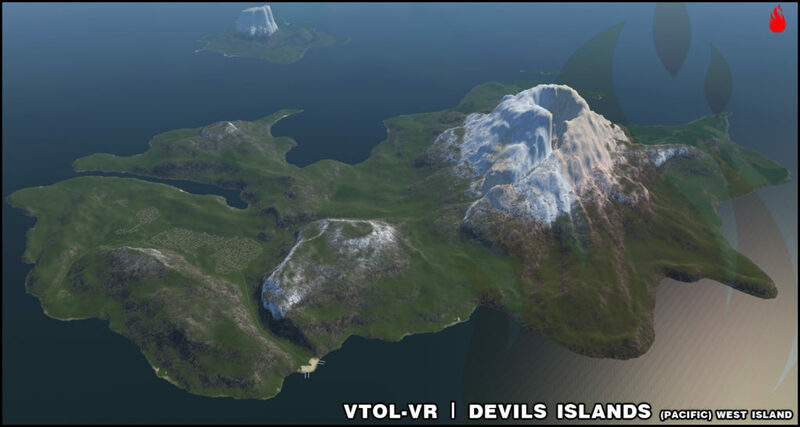 It appears that the VTOL world has a maximum ceiling of about 36,000′, which is fine for the size of the maps and type of flying that is done in the sim. The tadpole shaped AV-42C has a maximum speed of around Mach 1.02 and the G-limiter allows for a maximum of 10G – enough to start the blackout process, but usually speed and energy will decay enough to make prolonged blackout not much of an issue. Flip the G-limiter switch to OFF and you can pull about 16 instantaneous G, which blacks you out faster, but the resulting speed bleed is very rapid. The F/A-26B is Mach 2.08 capable, is also limited to 10G on the G-limiter, but can go as high as 30G instantaneously with the limiter off. This results in a very fast blackout onset that takes some time to recover from. 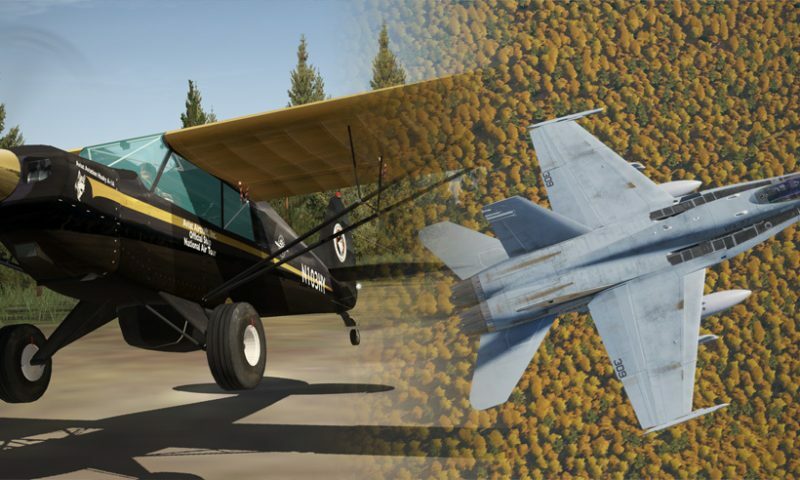 I’ve mentioned to the developer that it would be nice to have some damage or wing failure when one decides to take advantage of flying without the G-limiter – perhaps somewhere in the 13 to 16G area. 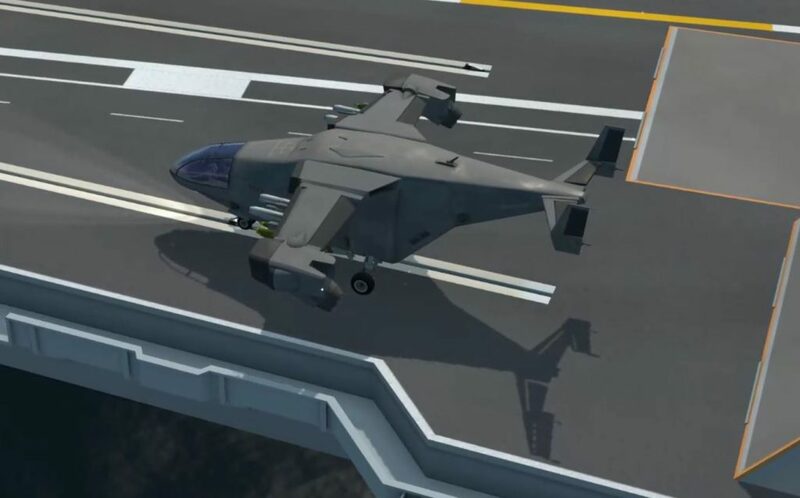 These are futuristic aircraft, so who knows – maybe they are built like tanks. But it would be nice if there were a penalty for just pulling as hard as you want. 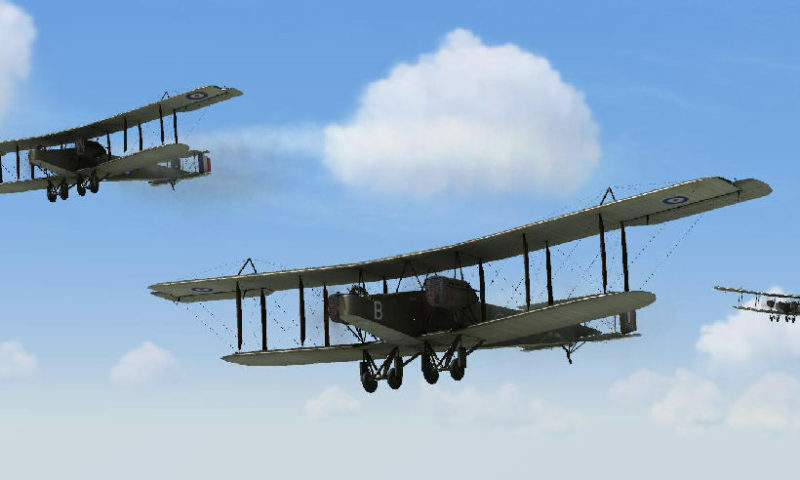 On the other end of the spectrum, slow flight and minimum controllable airspeeds are well modeled. 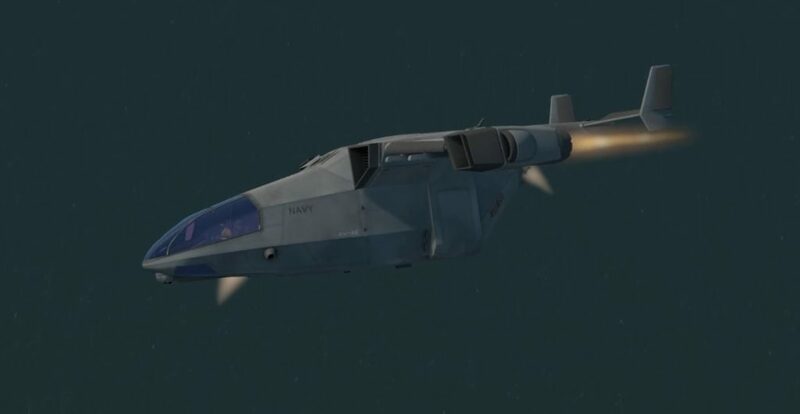 The AV-42C, with its tip mounted engines, is an interesting beast to fly on one engine. 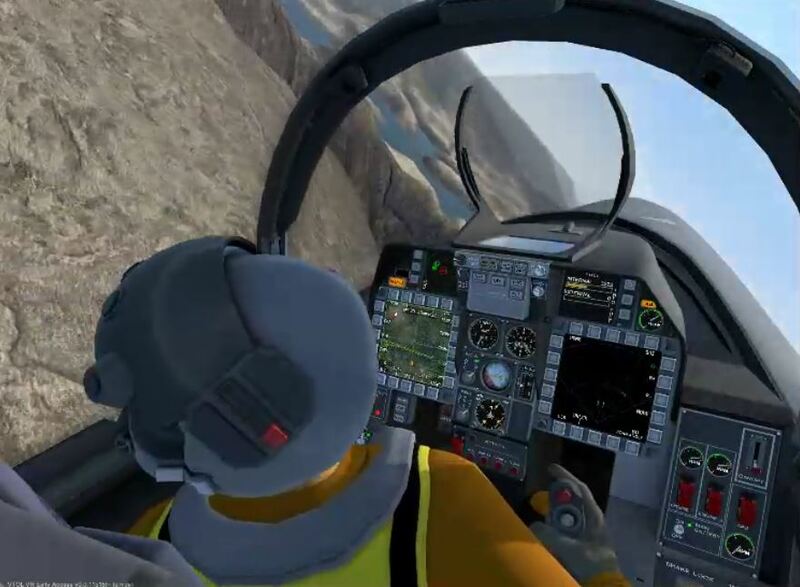 As one would expect, as you slow down, more and more rudder input and some slight roll is required to counter the thrust of the operative engine. 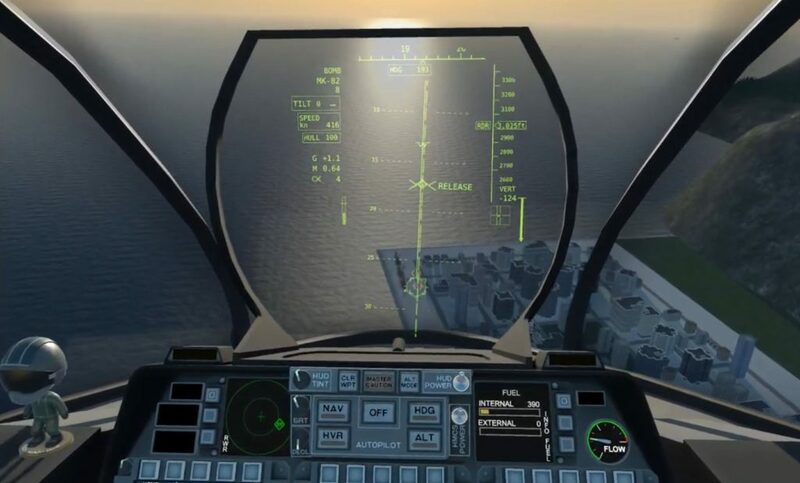 Eventually, you will be flying slow enough that the rudder will not have the authority to counter the thrust required for flight from the operative engine and the aircraft will yaw and roll into the dead engine. 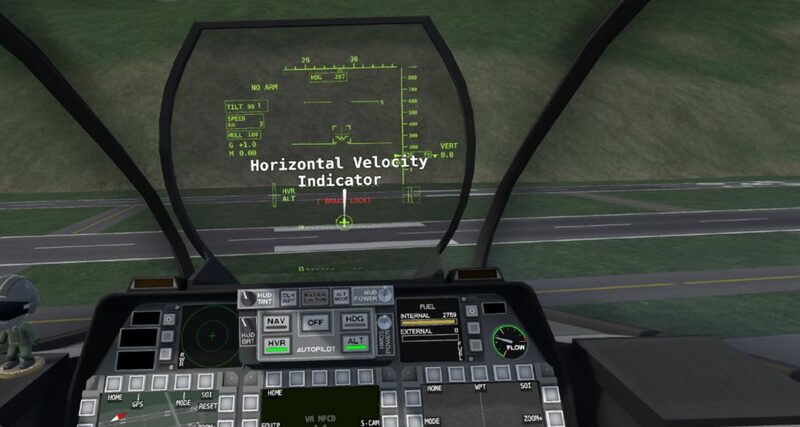 It is possible to flat spin the aircraft if you get purposely sloppy with lots of asymmetric thrust and rudder. 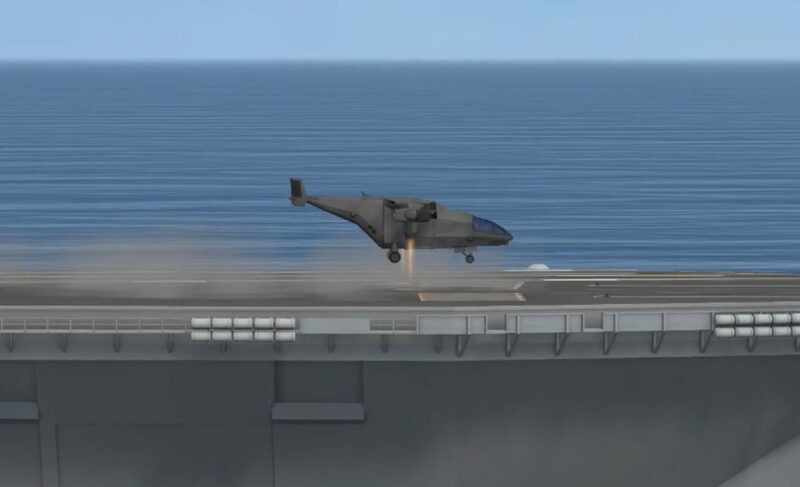 Vertical takeoffs or landings in the AV-42C are obviously not possible on a single engine – you’ll have to do a normal forward flight landing on the airfield or arrested landing on the carrier. Though refueling and rearming within the budget allocated for the mission is usually available, there is no mechanism for repairing damage. I’d love to see some sort of damage repair option at the cost of perhaps mission budget. 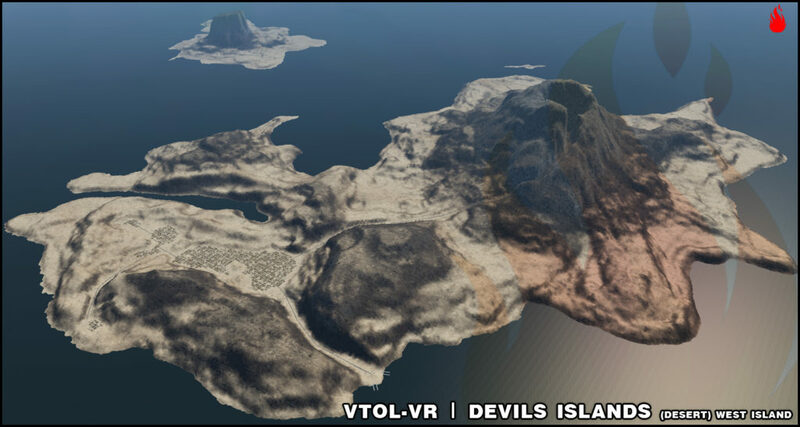 The F/A-26B Desert Cobra campaign features a different terrain from the AV-42C “The Island” campaign, instead showcasing a desert landscape with deep gorges and a much more expansive map. 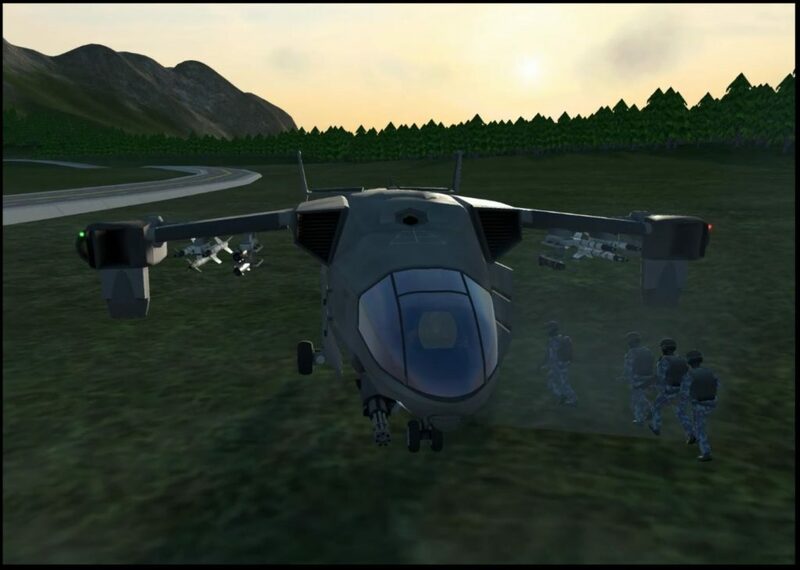 Campaign missions are of varying difficulty, with some of the missions requiring an investment of time to complete due to multiple overall objectives that sometimes must be met. 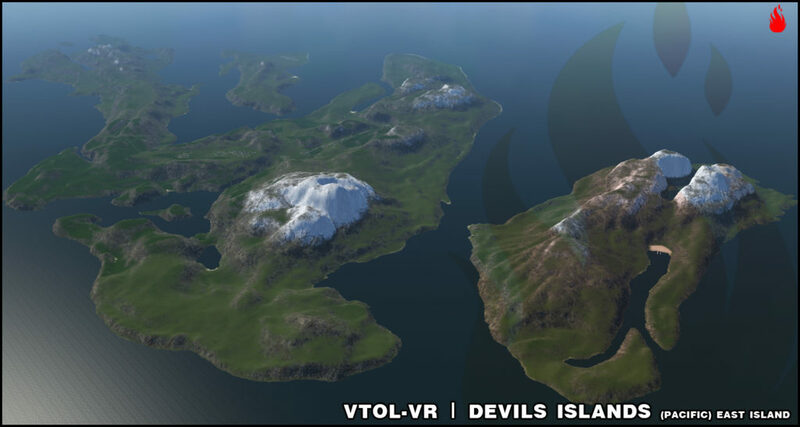 I have completed all seven of “The Island” campaign missions and I found none of them to be overwhelmingly hard, although several took me a couple of tries to complete. 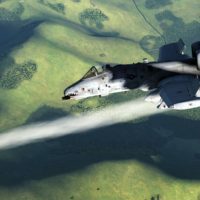 A mid-mission gamesave capability has recently been rolled out and is continuing to be tweaked. 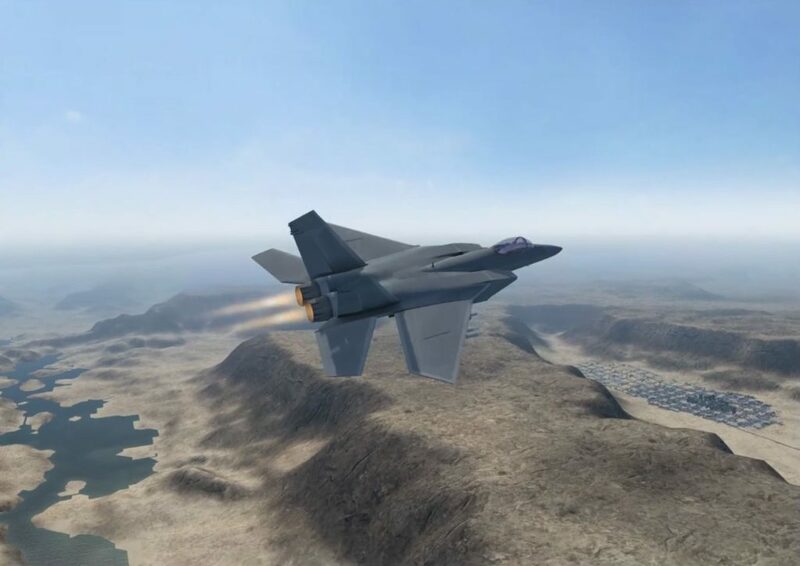 Smart tactics, managing your wingmen, making the right decision on weapons loads, and an eye toward self preservation are the key to completing each mission. 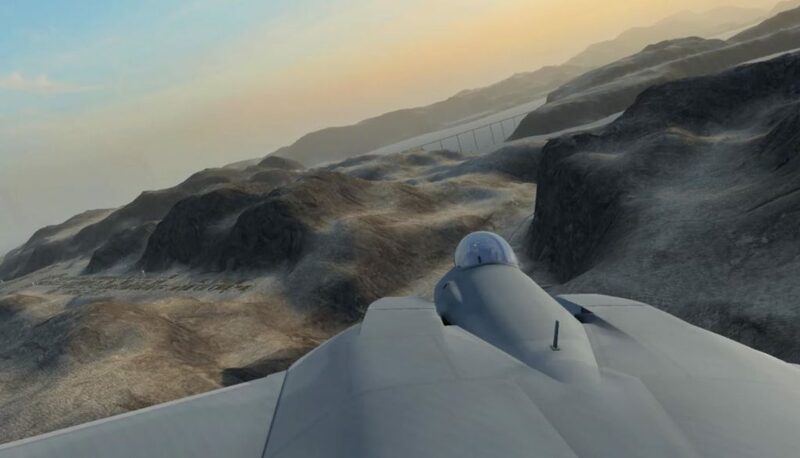 Friendly wingmen, bombers, and AI defenses can help turn the tide if you can lure the enemy to fight on your terms. 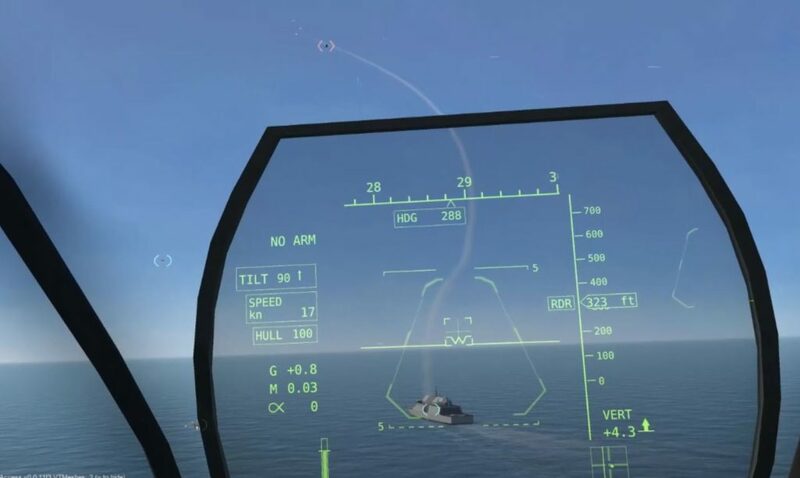 Enemy anti-aircraft gunners and missiles are good, but if they can be easily defeated if you beam the missiles, jink aggressively when being shot at, and use your countermeasures diligently. A 2D Mission Editor is available for community members to create their own campaigns and missions. As well, a map editor is also allowing creative users to build some fantastic theaters providing a great canvas for mission designers to further push the capabilities of the mission editor. Maps of up to 196 km x 196 km are possible, although community members have reported larger sizes are technically possible, perhaps at the cost of performance however. 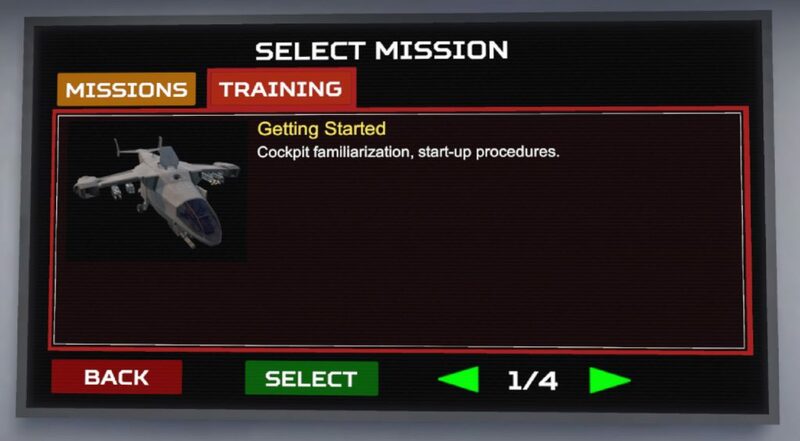 There are a good number of single missions available as well as some fantastic multi-mission campaigns. 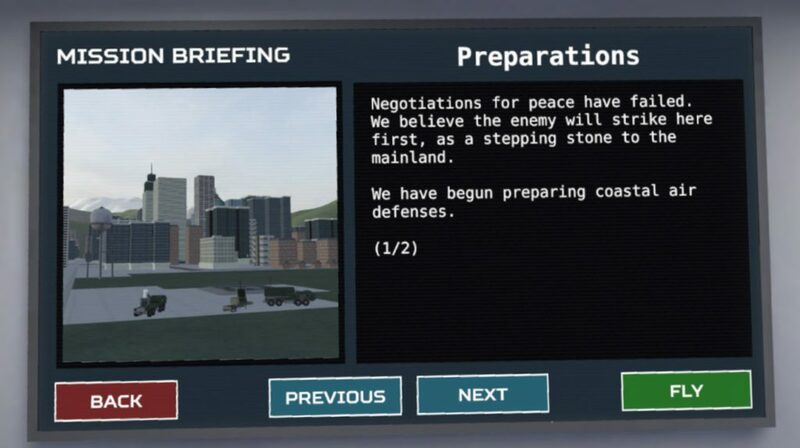 I recently completed the three mission mini-campaign “Regime II” and was amazed by the thoughtful mission design and atmosphere that the creator “NickVR” implemented. 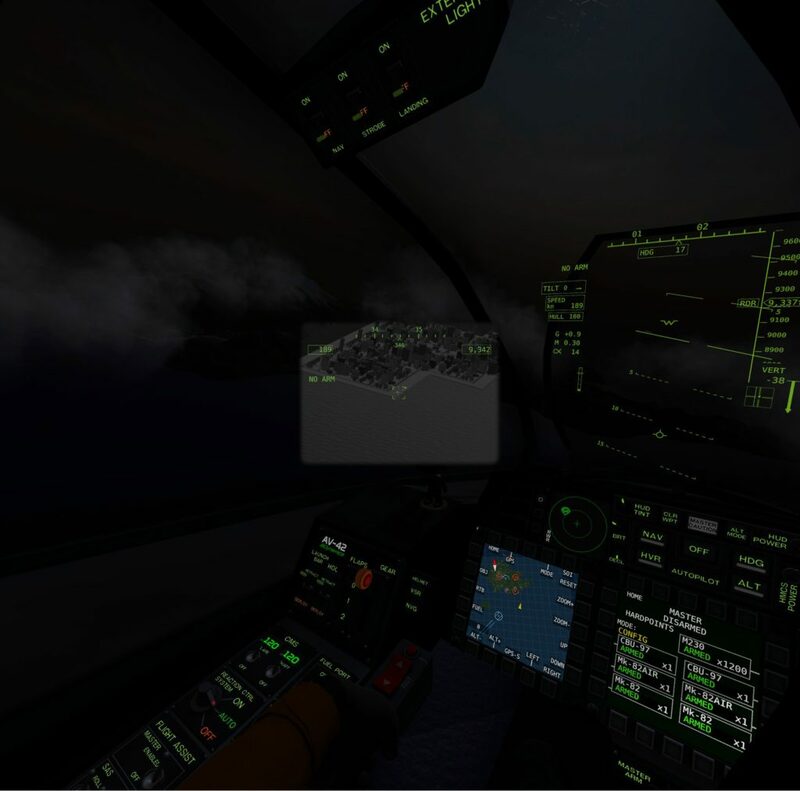 Night missions in VTOL VR are among the most atmospheric I’ve flown in any simulator. 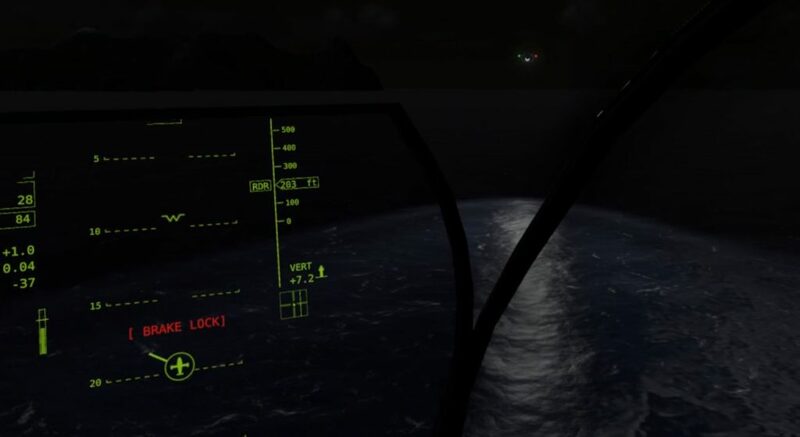 There is something uniquely moody about the moonlight, reflections from the water, and the adjustable cockpit lighting that make VTOL VR very special with regards to night flying. 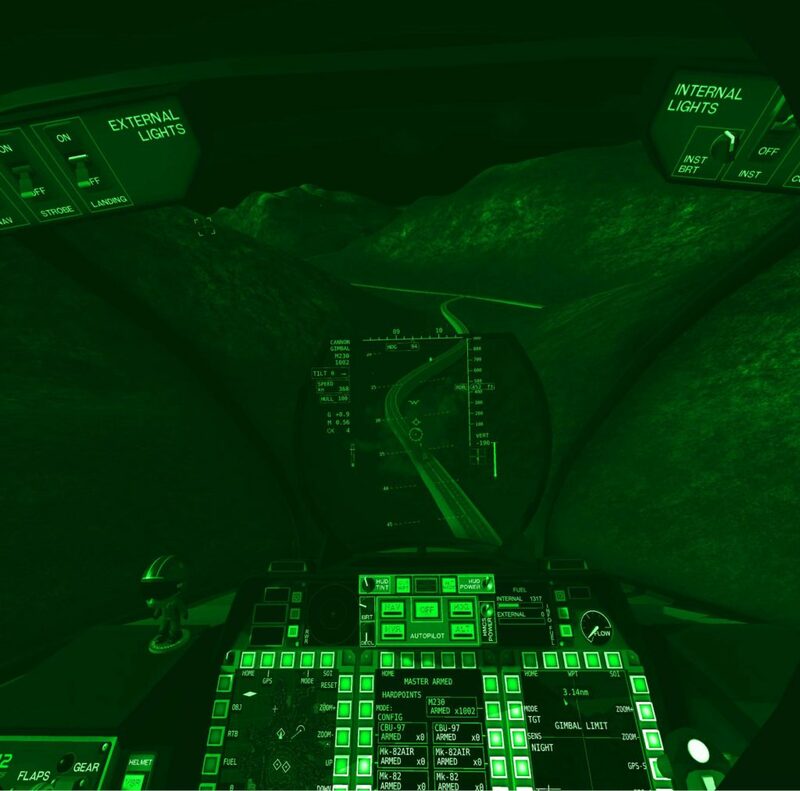 On some missions you’ll flip back and forth between the night vision visor and ambient light depending on the circumstances. 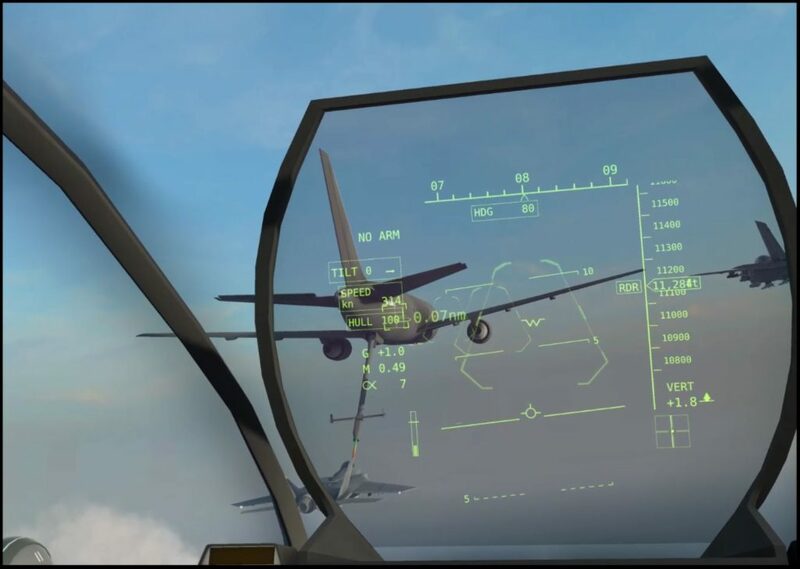 If the developer ever sees fit to add additional clouds, rain, or fog options to the sim – the possibility of some seriously terrifying flights will be possible. AI wingman behavior is fair – but they aren’t smart enough to be considered anything other than disposable. 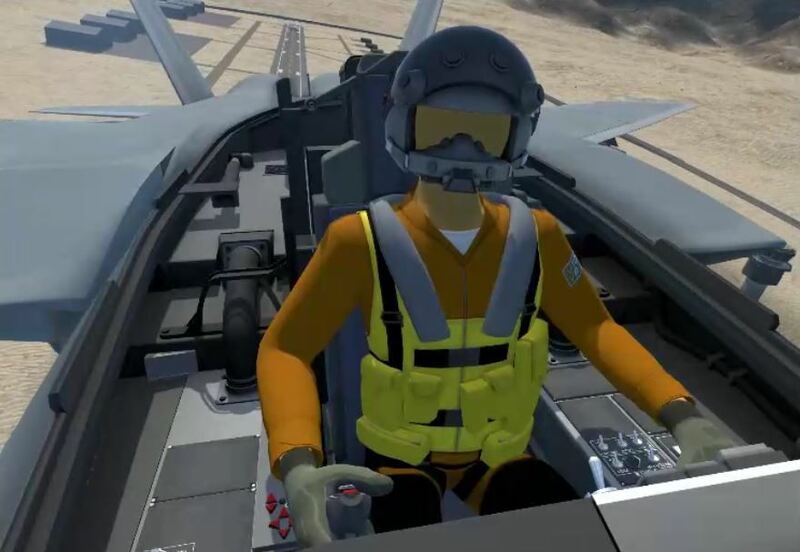 One very cool option is available in VTOL VR – flip a switch in your aircraft and the sim integrates with Windows voice recognition to allow you to verbally command your wingmen. 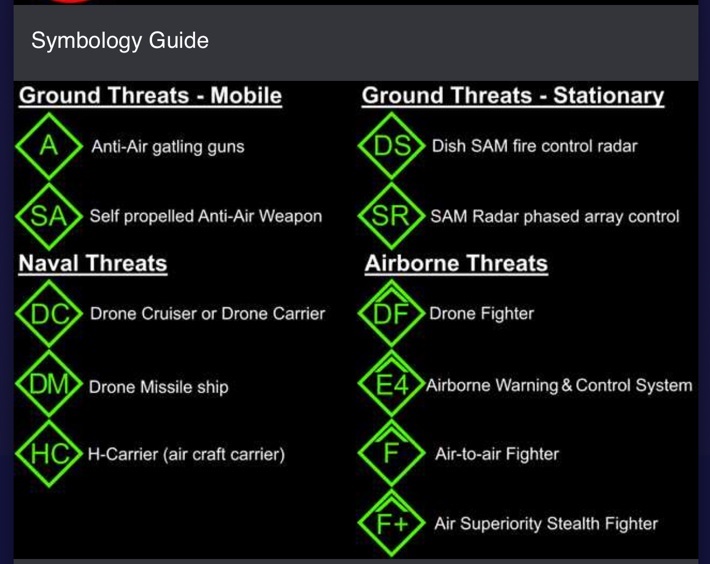 Commands include attack instructions, formation, orbit, rules of engagement, refueling, and RTB commands among others. 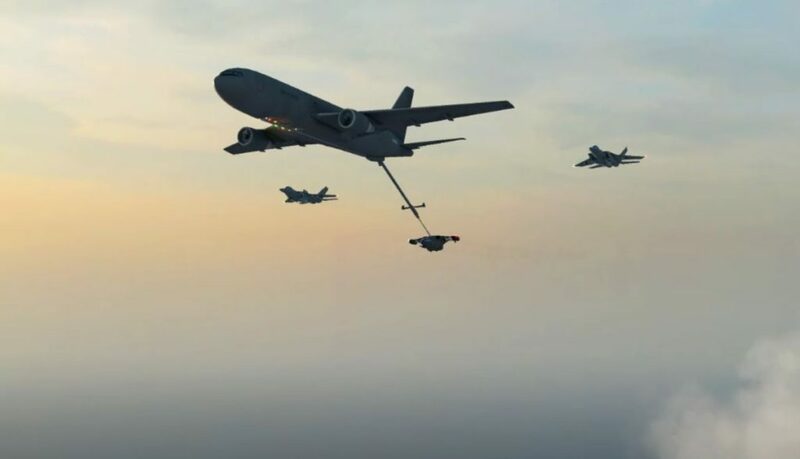 It is nice to be able to send a wingman to refuel or return to base to rearm if they survive that long. As well, basic ATC requests are recognized as well. 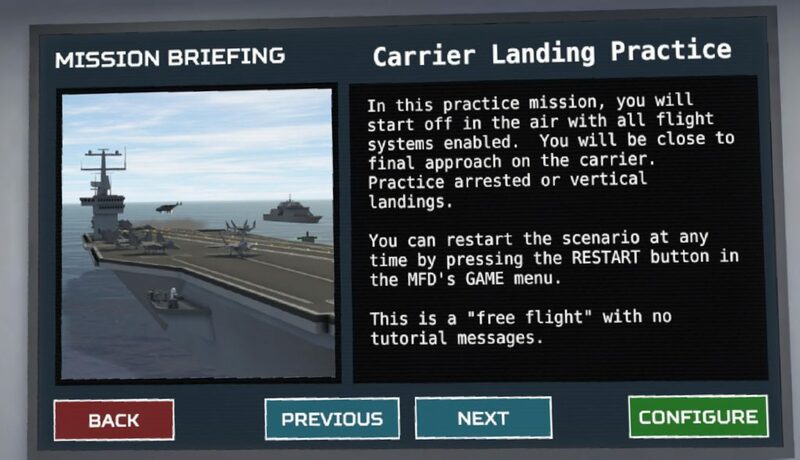 Asking for takeoff instructions on the carrier will result in ATC assigning you a catapult (1 thru 4) and giving you some pre-takeoff configuration reminders. 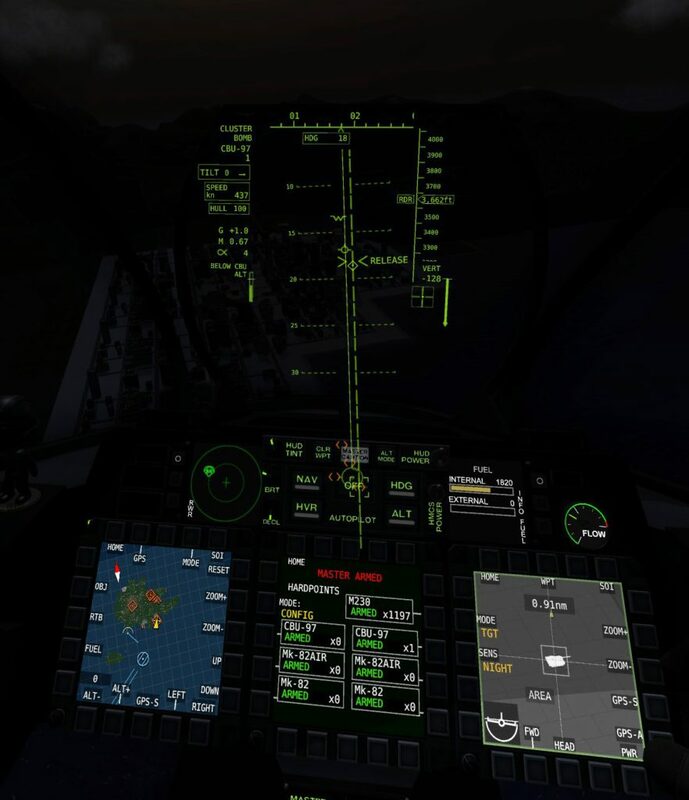 When cleared to land, an inbound runway course and CDI are placed on the analog compass. 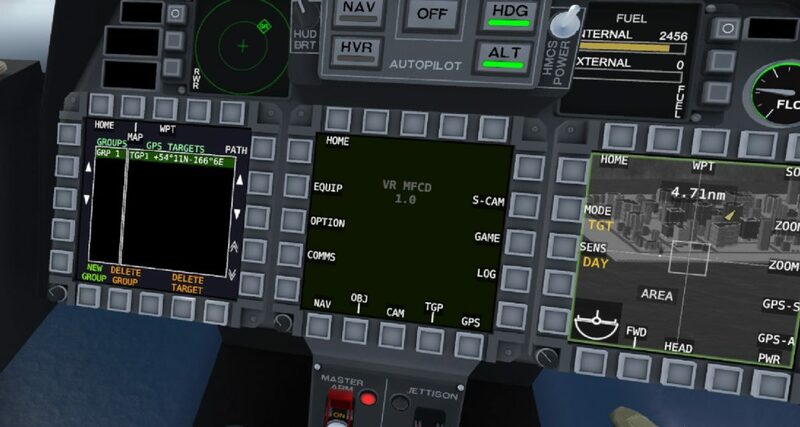 You can rotate the course knob (CRS) to select the course, and the heading autopilot mode will also slave to the analog HDG bug. 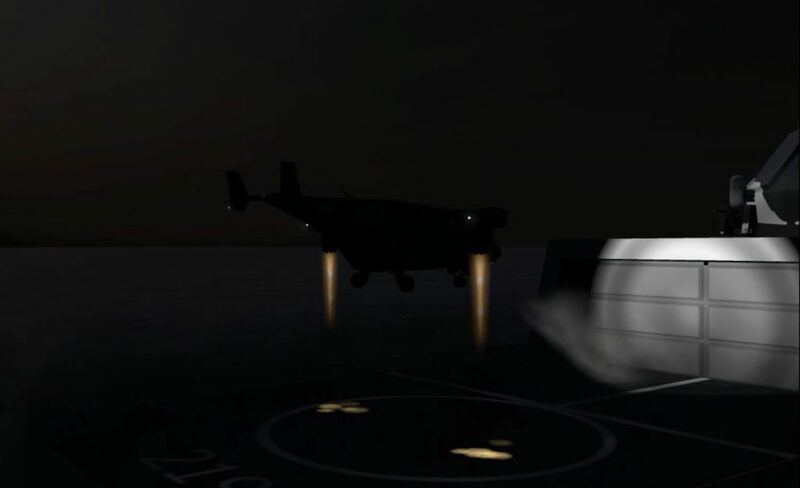 It wouldn’t be hard to imagine ILS / ACLS approaches in bad weather in the future. 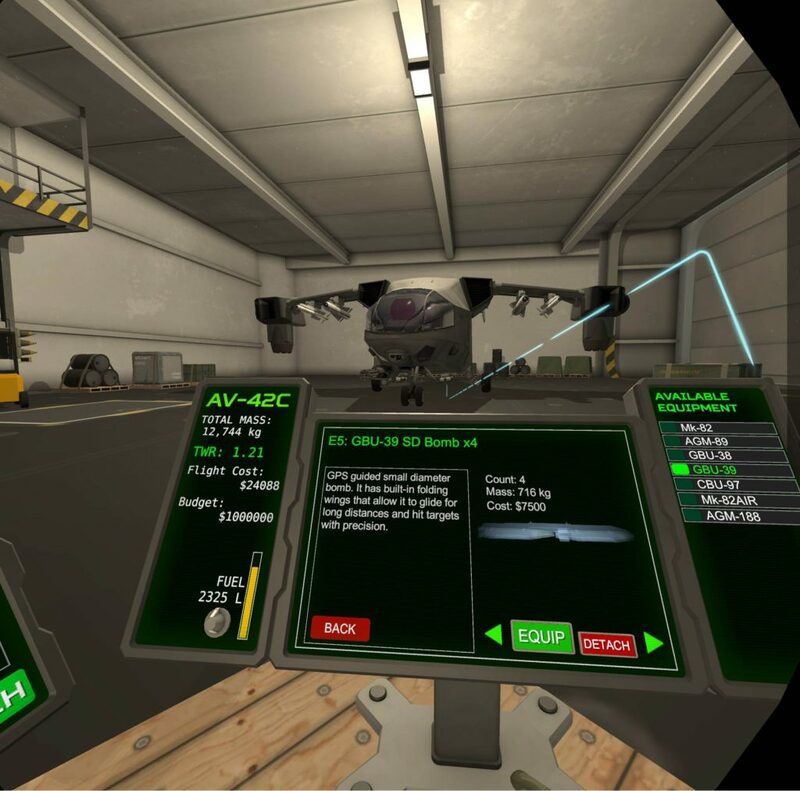 As an Early Access title, VTOL VR is in a constant state of progress and improvement. New features are added with nearly every build. 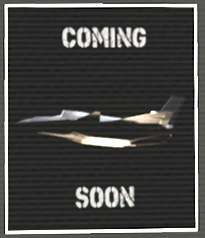 In fact, a recent teaser placeholder has been placed in the aircraft selection list that hints at a coming third vehicle. 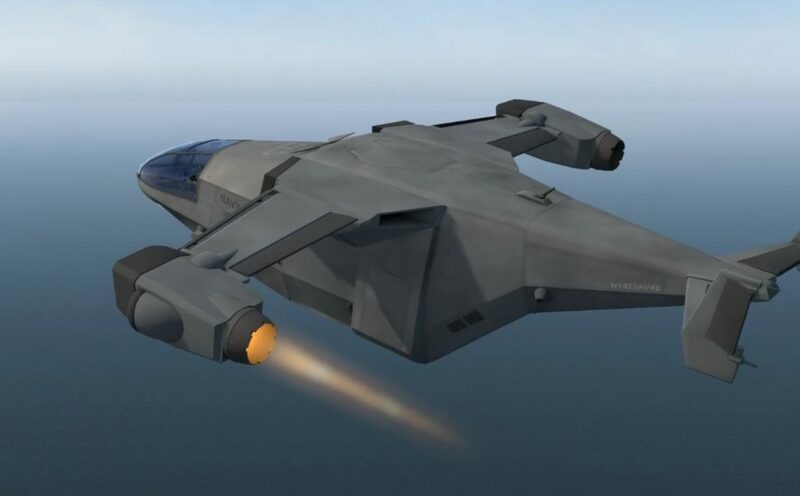 Speculation has been running rampant, but it certainly looks like a a delta-wing, front canard fighter of some sort similar to a Dassault Rafale or Eurofighter. Of the listed long term goals, I think the most desired by the community is probably the most difficult to achieve – multiplayer. 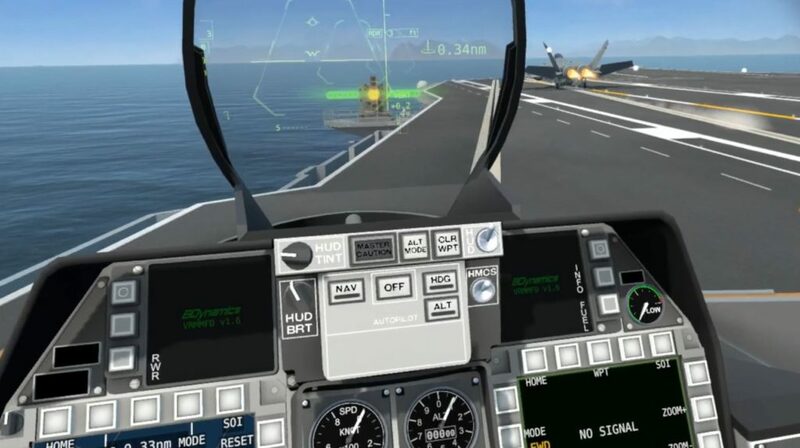 It would definitely intensify interest in the sim, and I know I would be absolutely over the moon to share in the VTOL VR experience with other players. 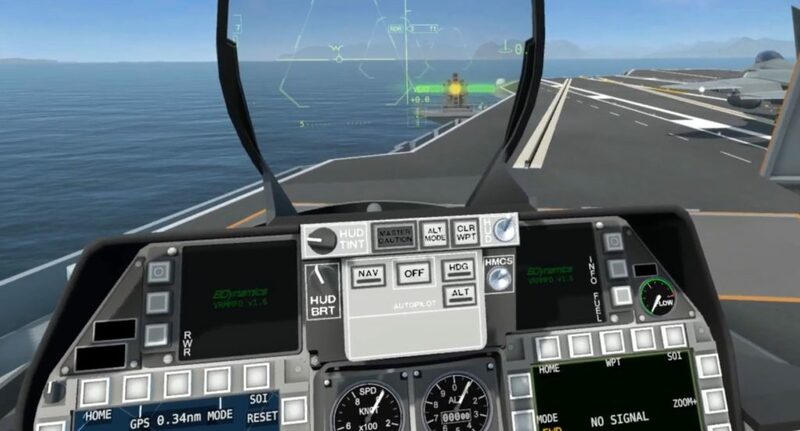 The other two hot-button issues are hardware controller support beyond the rudder pedal option that is currently in the game, and a non-VR version of the game. I’ll take the perhaps unpopular stance that I like the fact that this sim is not tied to hardware controllers and that it is a VR only title. 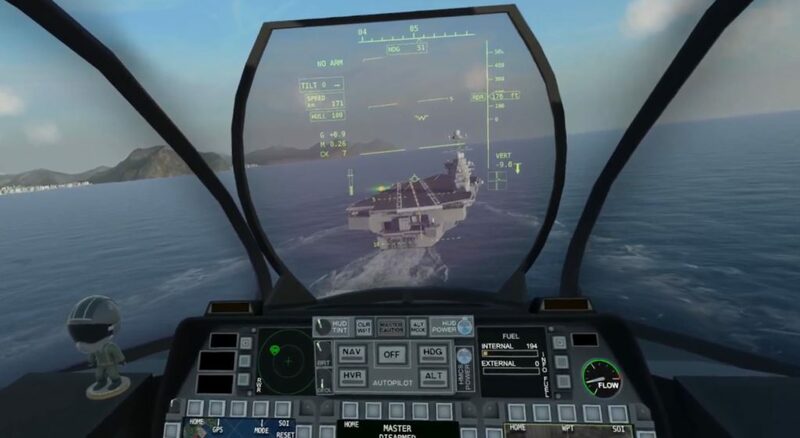 The very basis of the game was VR interaction and the sim executes it flawlessly. I would honestly rather just see the developer focus on this title as he envisioned it rather than reaching to be more inclusive – an odd take for a sim enthusiast like me I’ll grant you. I can, however, see the arguments for hardware controllers and a non-VR version. 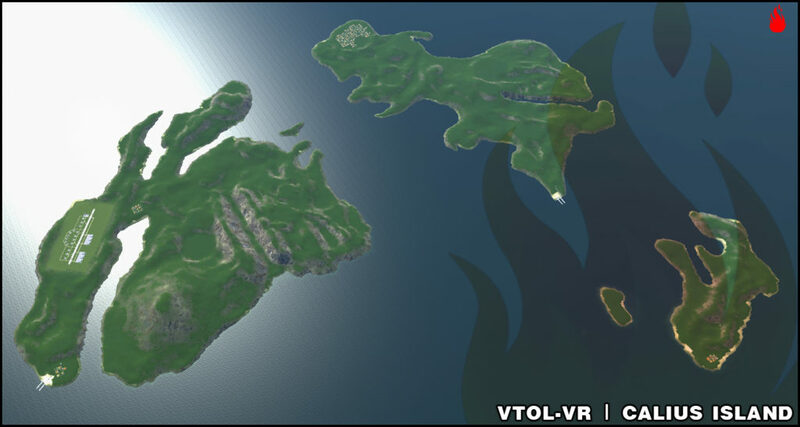 If the VR and non-VR worlds can coexist together (ideally in an online/multiplayer way), then I’d be willing to concede more is better. I’d just hate to see this brilliant VR title get muddied down with non-VR obligations. 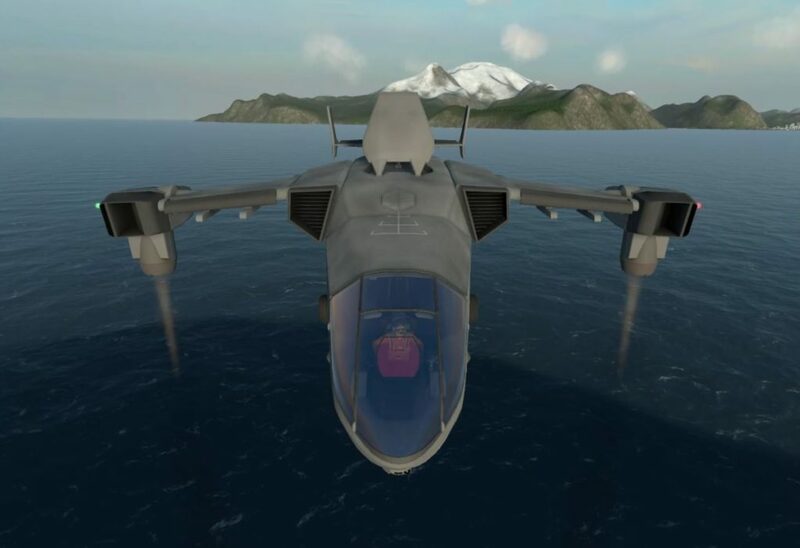 It is also worth mentioning that this is a sim that would very much appeal to DCS World type players, but VTOL VR is not DCS World, nor should it strive to be. 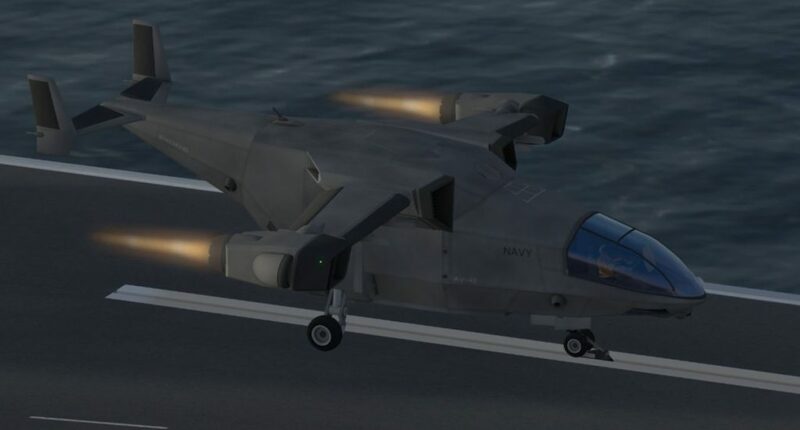 It doesn’t need to be photo-realistic, or have missile parameters that need EM diagrams, or have an INS that takes 10 minutes to align. 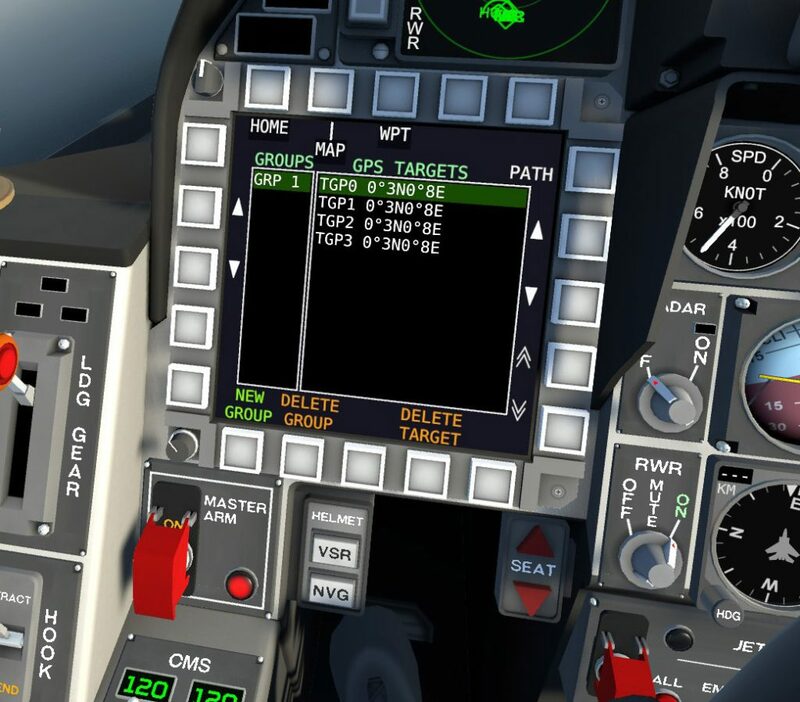 It is already a complex sim, but one that does not need to fit into the traditional sim slot. 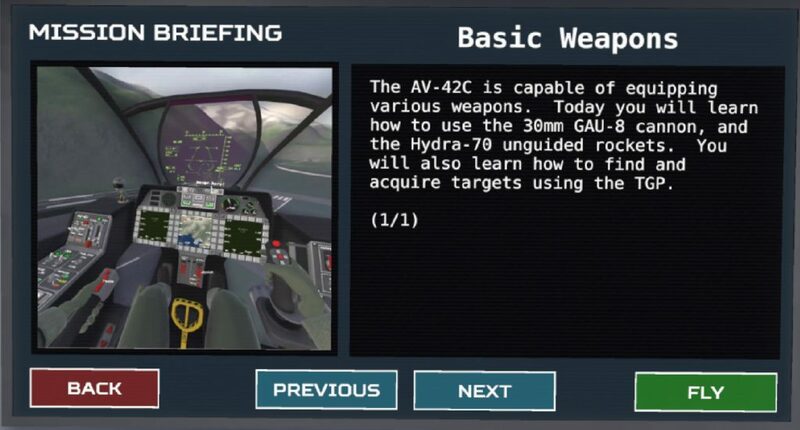 On a personal “wish list” note – I’d really like to see things like sling-loading added to the AV-42C, additional friendly and enemy forces, and just an overall widening of available objects in the mission editor to allow the creative user community to build even more complex scenarios. 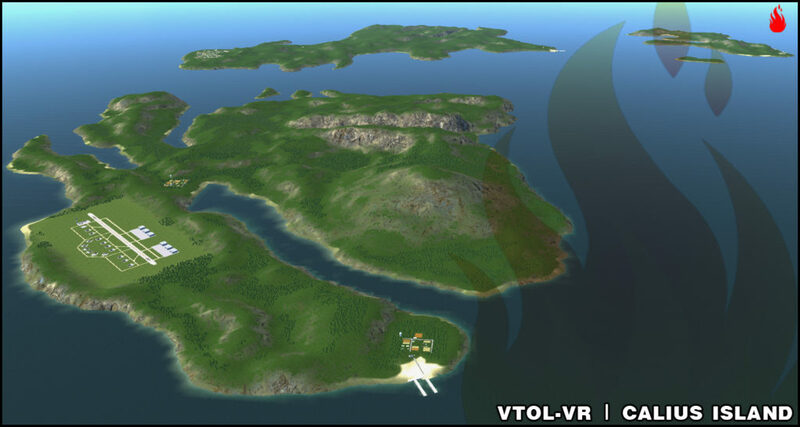 VTOL VR is currently one of my favorite flight sim experiences in a field that is (thankfully) quite heavily populated with choice. 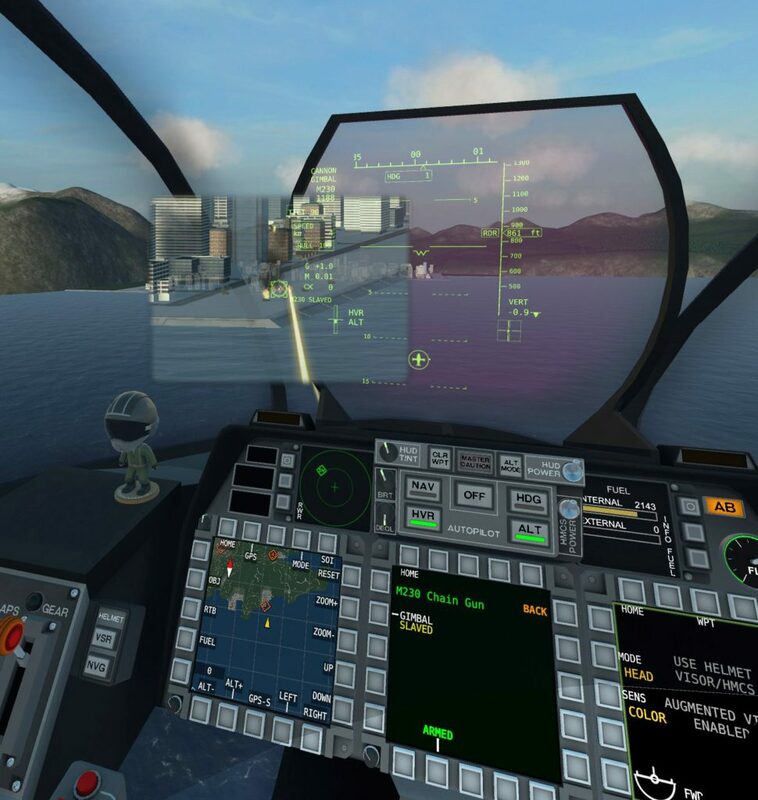 When you narrow the criteria down to VR combat flight sim experiences, I still find myself turning to VTOL VR more often than not because of its quirky nature and depth of systems that don’t require an inordinate amount of study. 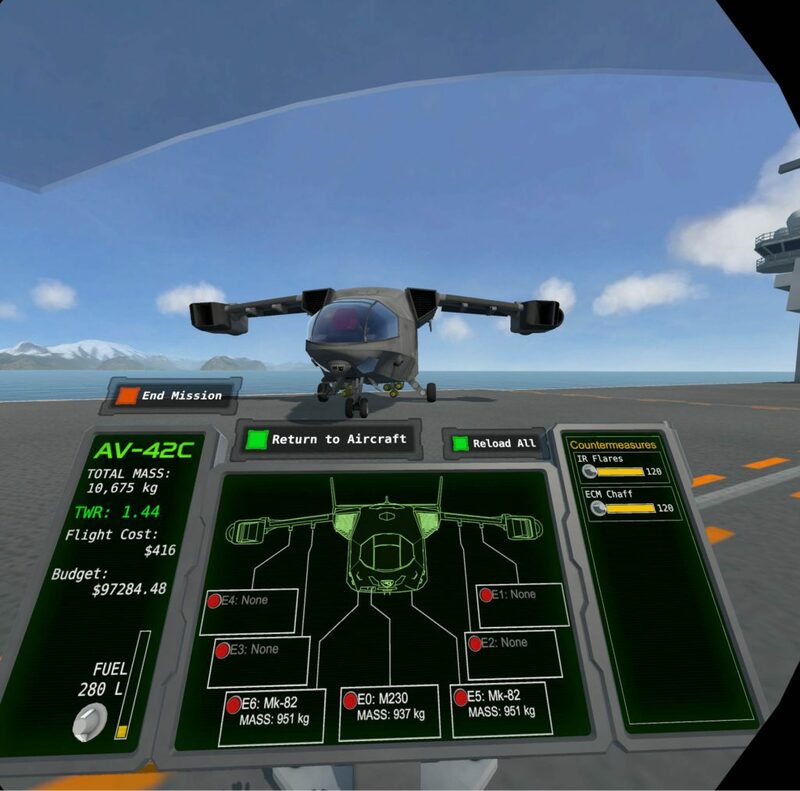 Successfully completing a mission in VTOL VR feels like a real accomplishment, and the natural flow of the cockpit experience is very compelling. 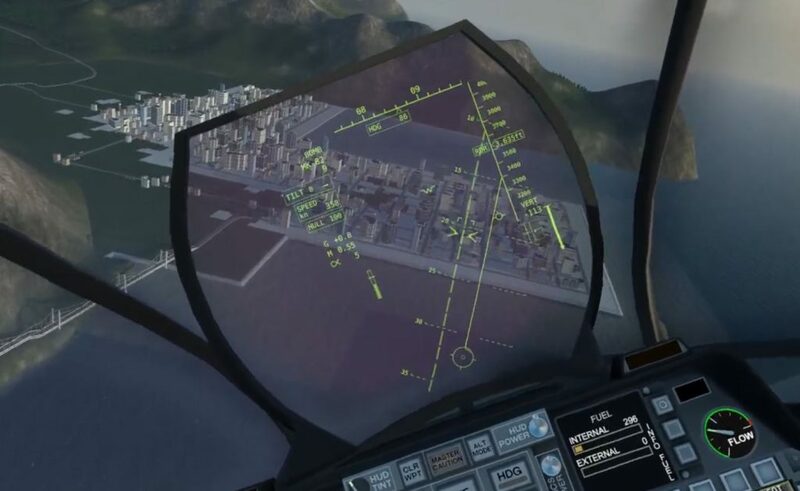 It is simultaneously a hard and easy experience – a very balanced sim that feels like a game, but plays like a sim. I’m hopeful that it will continue to both expand in features and expand in community involvement. At this point, I could play endless single missions and campaigns on new and old maps, and I think the experience would not get old. Multiplayer would be the most game changing feature to be added without a doubt. With all of that said though, what we have already is fantastic. 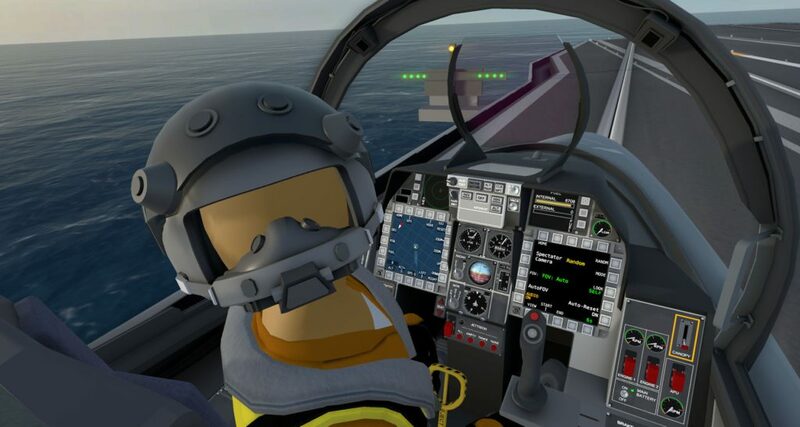 It is very rare for a single-person development “team” to create such an incredibly deep simulation – Tsuyoshi Kawahito (TK) of ThirdWire and Strike Fighters fame comes to mind. You are keeping good company if you measure up to someone like that. 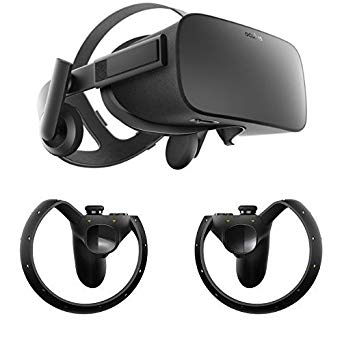 I realize that VR hardware is still not a mainstream sim item, but as prices fall and older generations of technology drop into the bargain bin, I’d encourage you to pick up a VR headset and see what all the buzz is about. 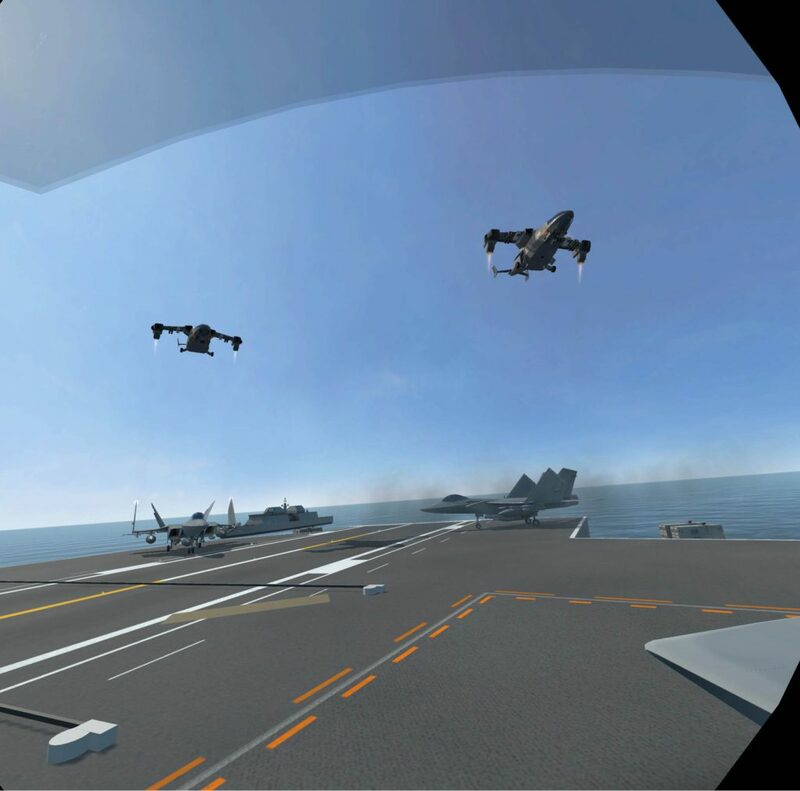 At this point in the maturation of VR technology, VTOL VR is a near perfect showcase for the technology.